Let's start with the train ride to Portland from L. A. 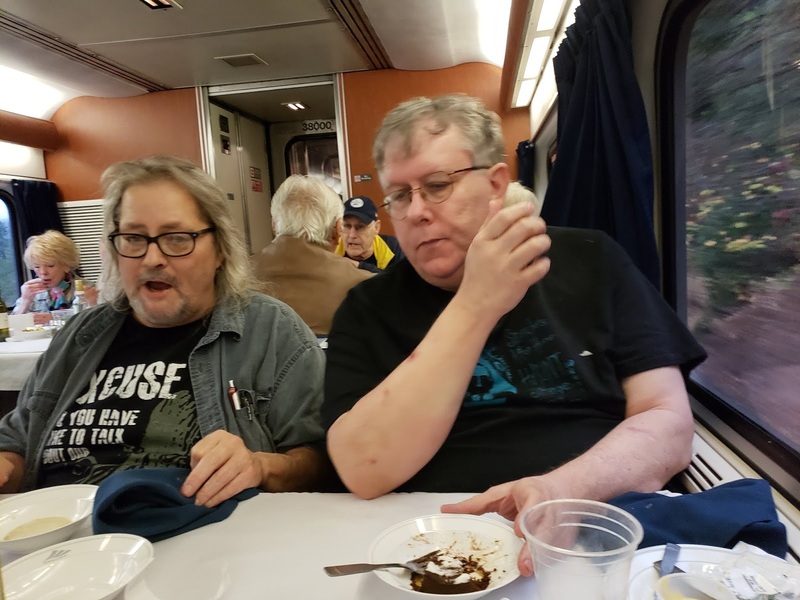 The train ahead of us hit an intoxicated individual and we were delayed for about an hour and a half, just before Santa Barbara. 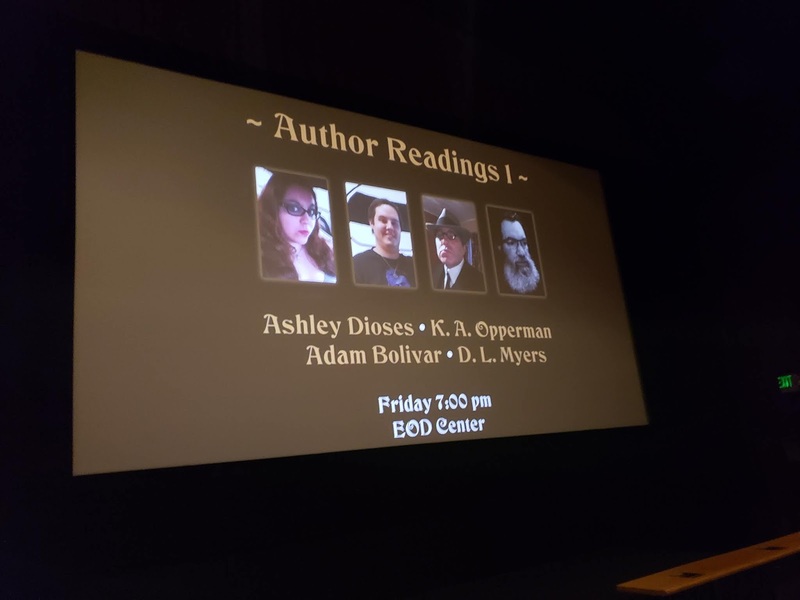 Talk about the beginning journey to a horror fest. 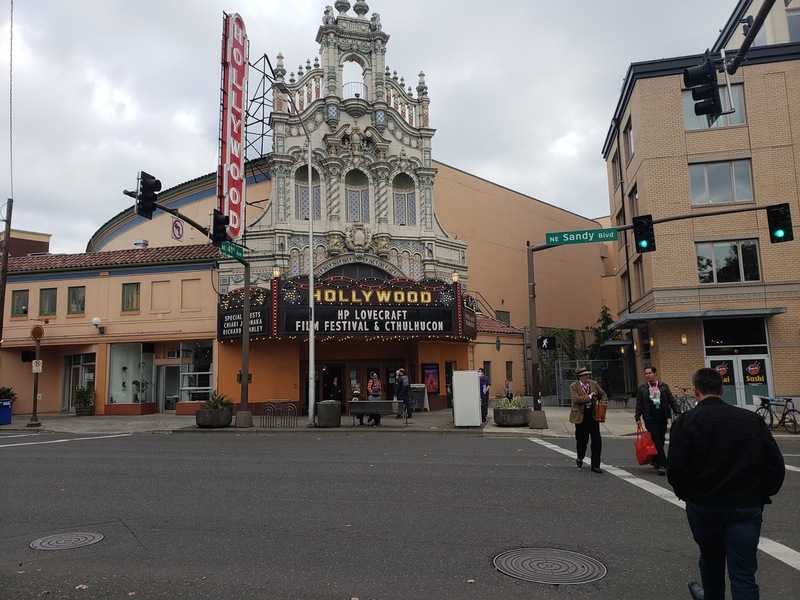 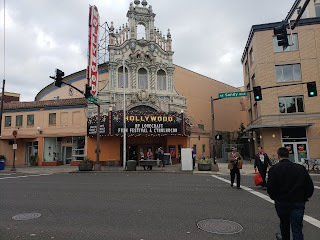 We left on Monday, Oct. 1st and arrived in Portland Tuesday. 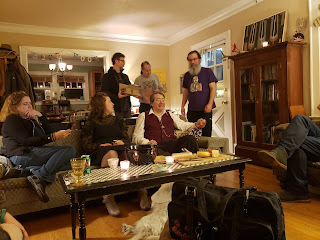 We were picked up by our amazing host and balladeer, Adam Bolivar. 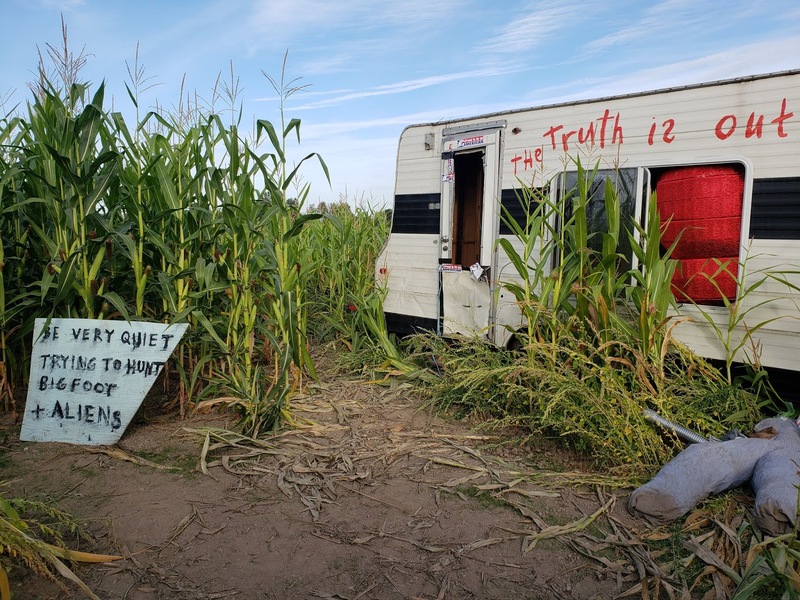 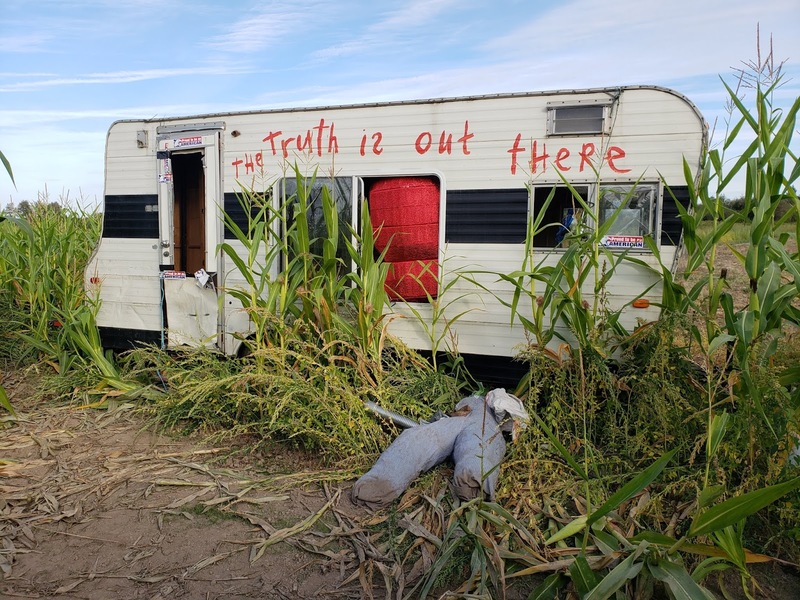 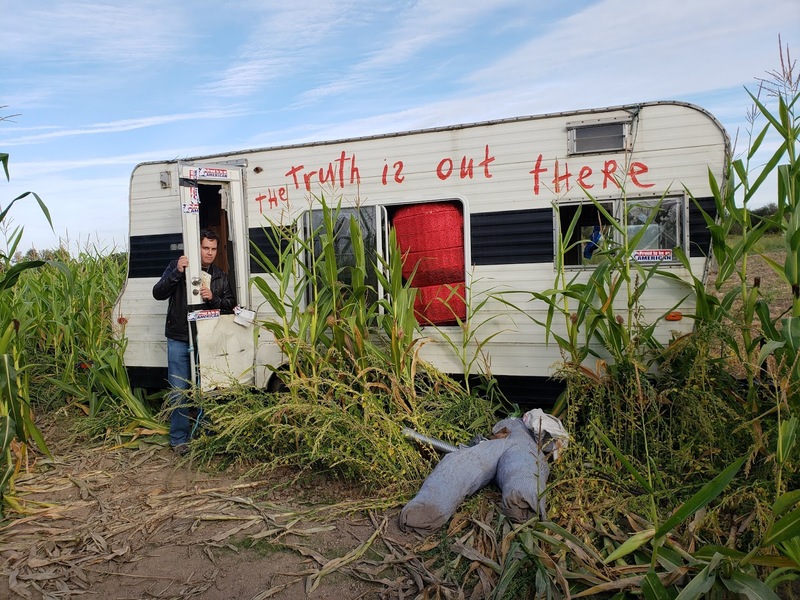 We went back to his house to unload and chat as we waited for the fourth member of the Crimson Circle, D. L. (Dave) Myers to arrive from Washington. Once reunited, we headed for dinner at the Brass Horseshoe. After dinner, we headed to our favorite cemetery to find that there was now security and the gates were being closed for the night! 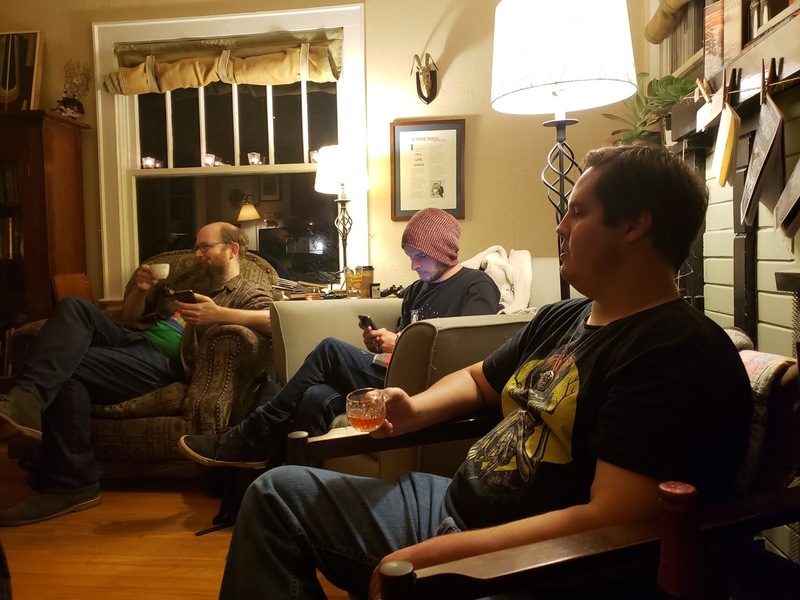 Lame. 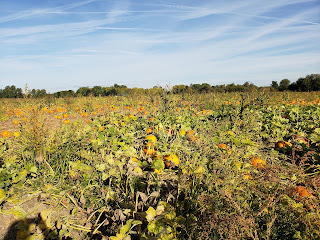 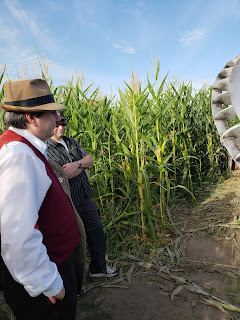 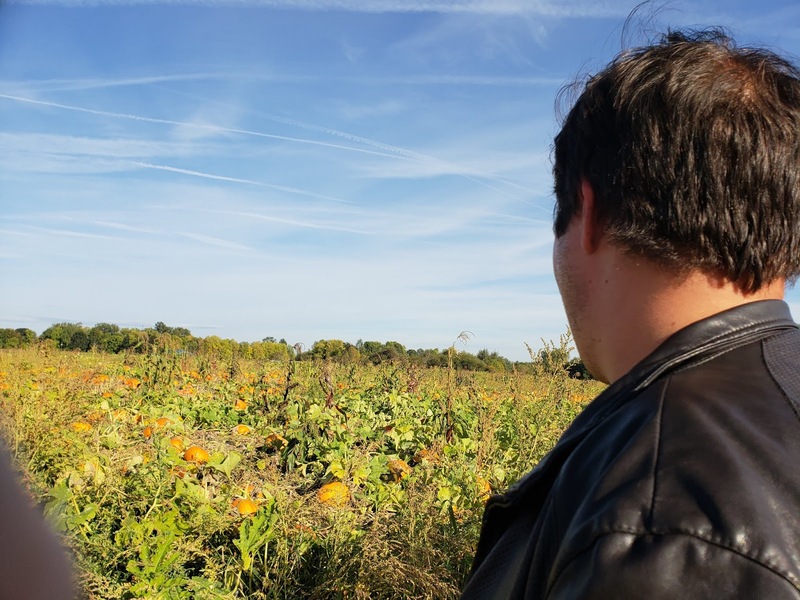 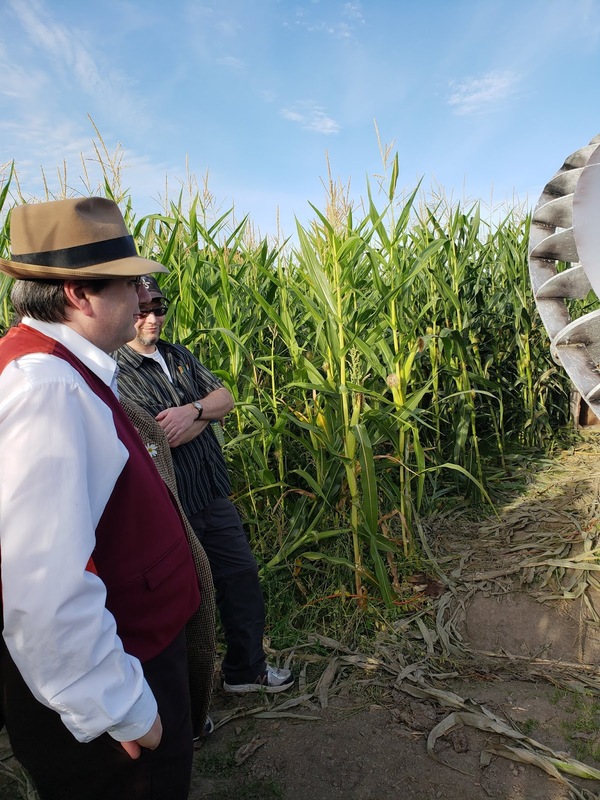 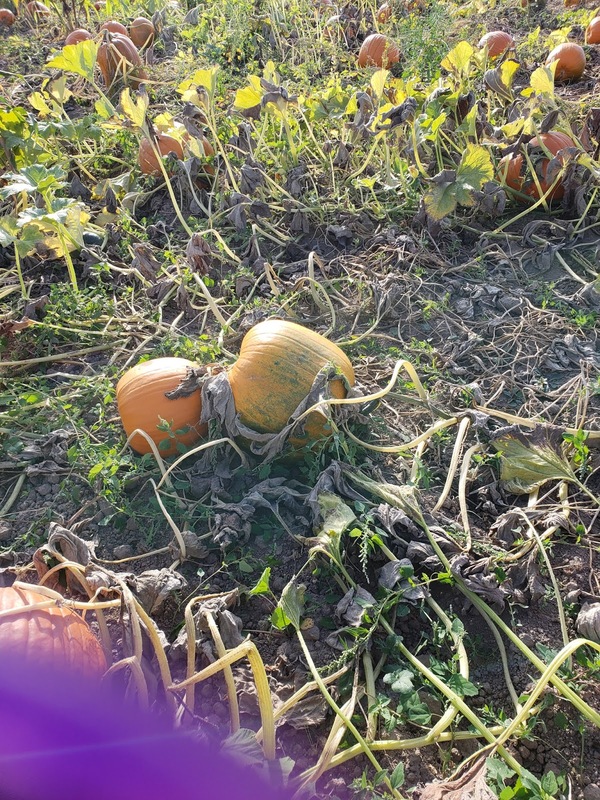 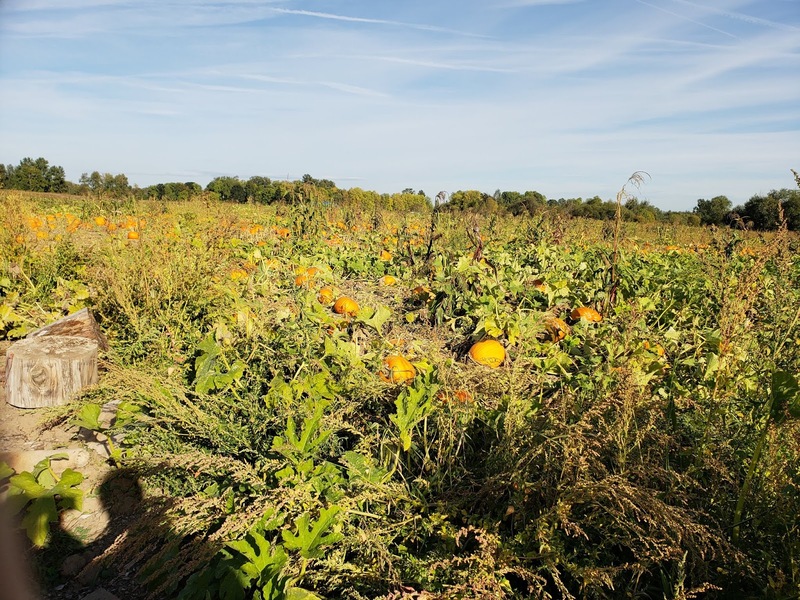 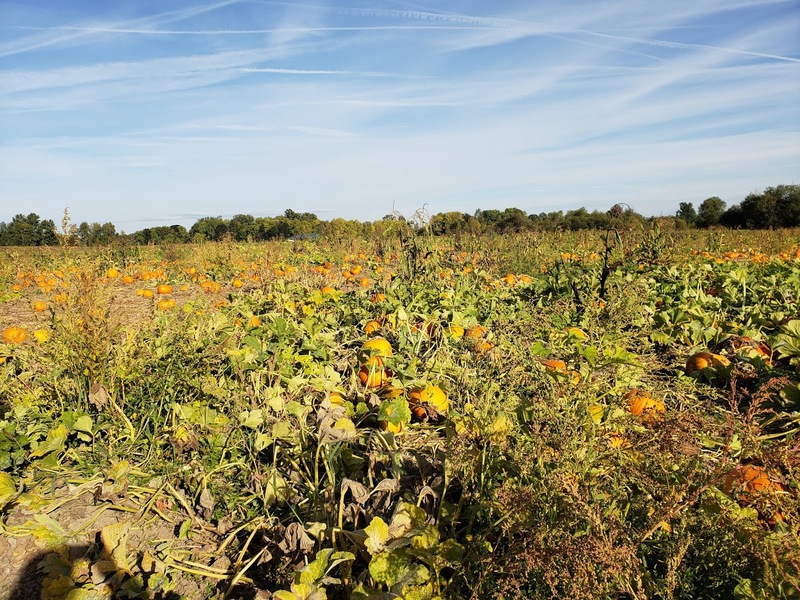 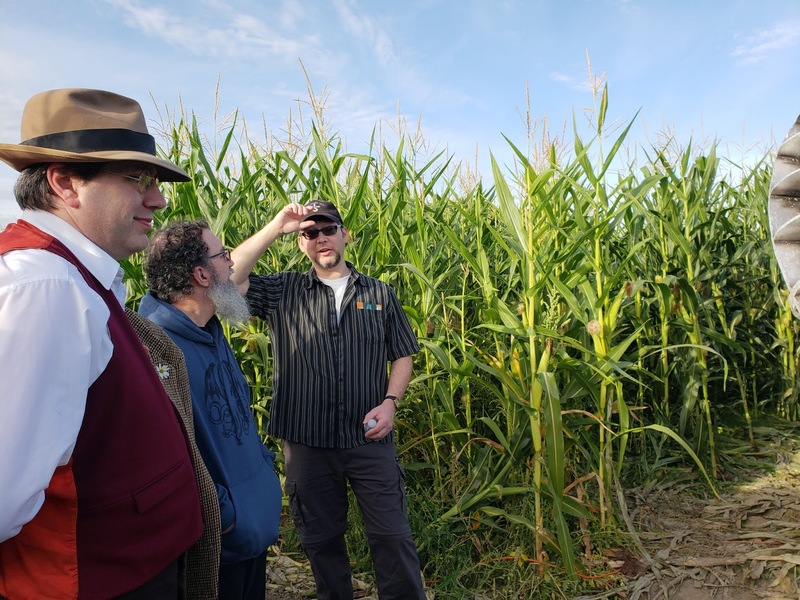 Wednesday we went to bookstores and went antiquing to find Halloween goodies while we waited for The Audient Void illustrator and graphic designer, Dan Sauer, to join us before we headed to Sauvie Island to check out their pumpkin patch and themed corn maze. 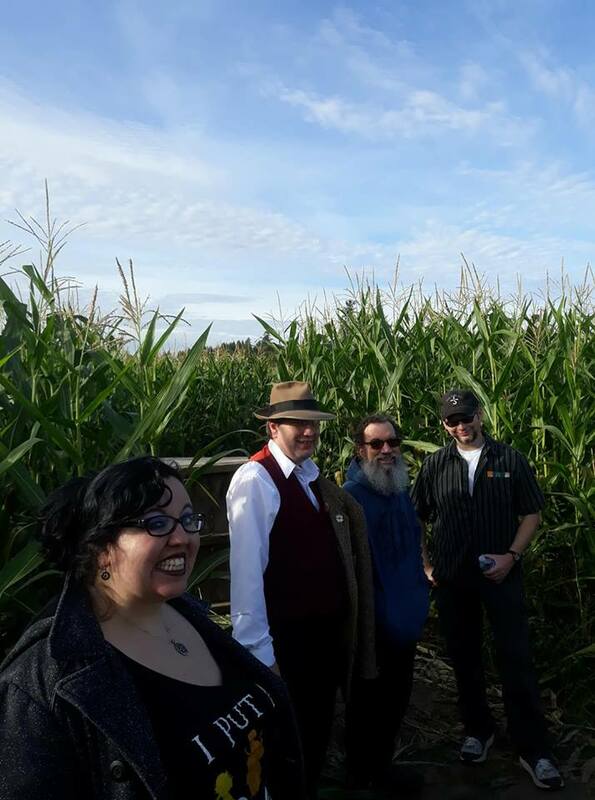 We then headed back to the cemetery to do a little necromancy and pay respects to the departed. I'm sure we ate dinner sometime that day but I can't remember where or when. 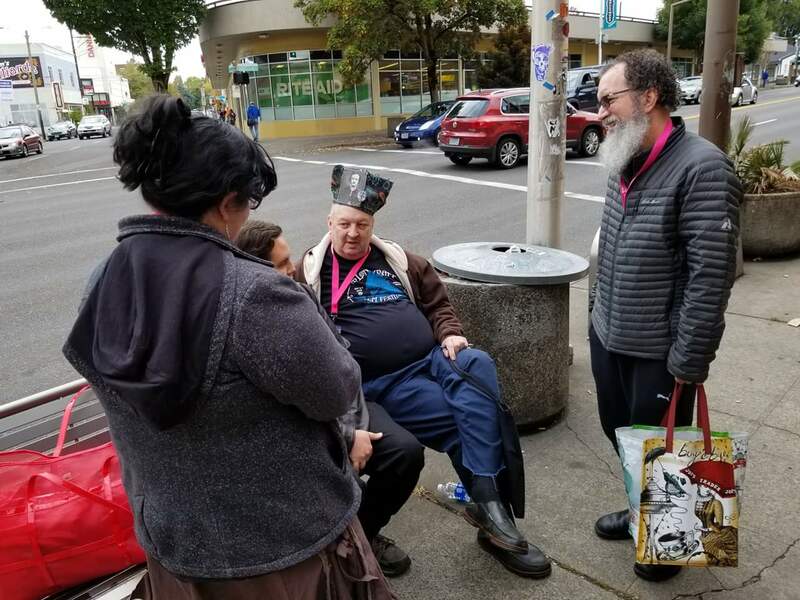 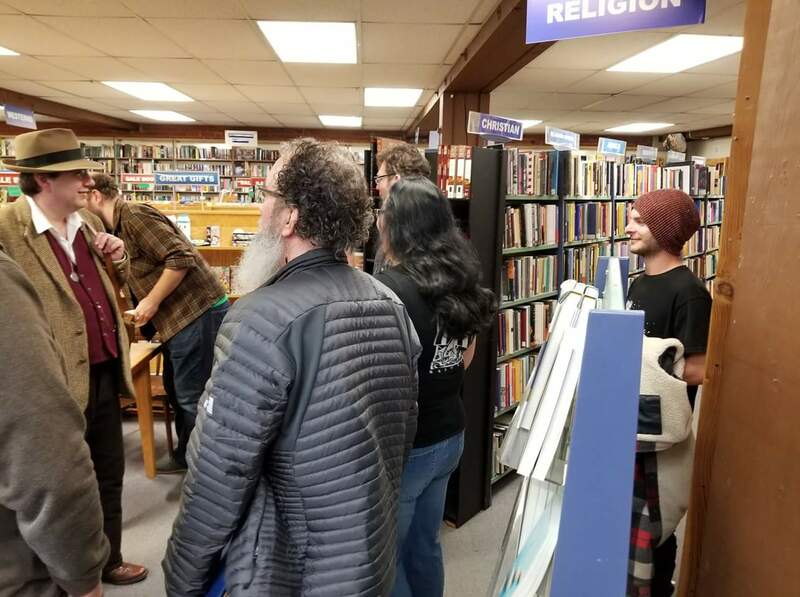 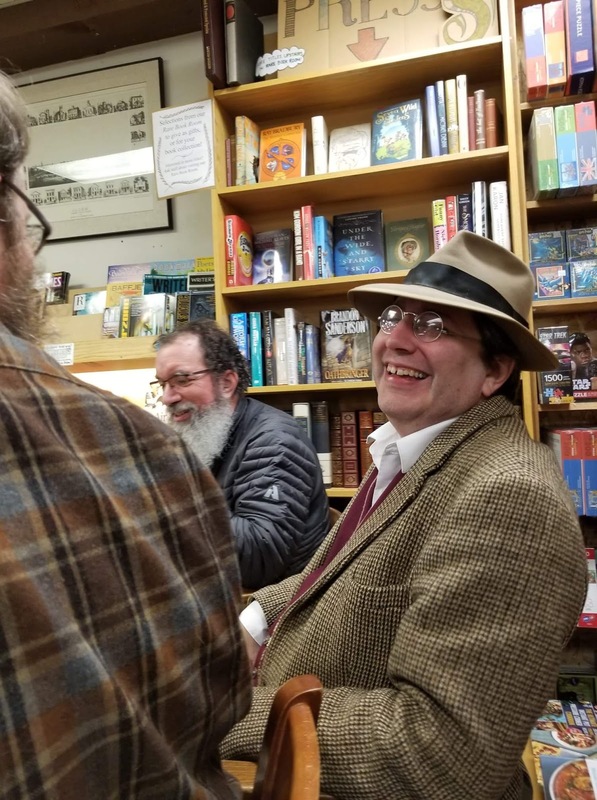 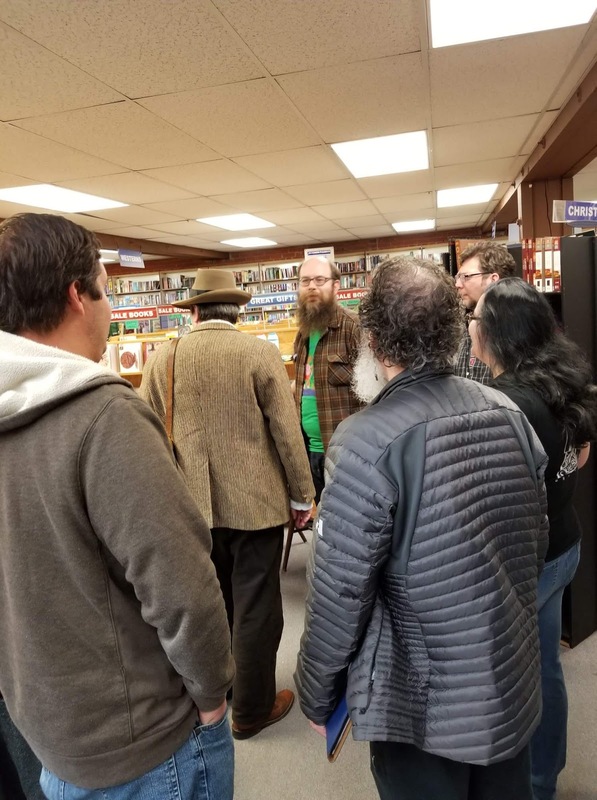 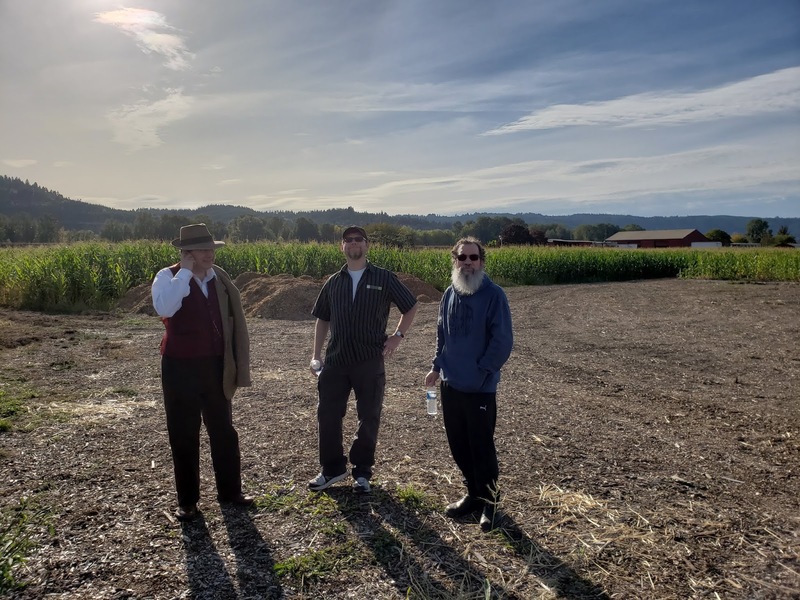 Thursday we went antiquing a bit more, then picked up Boss Hussey (Derrick), publisher of the incredible Hippocampus Press, and headed to the Book Bin in Salem for The Audient Void issue 6 release party. 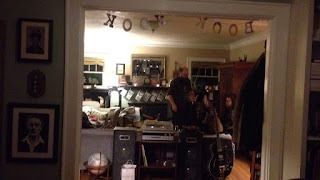 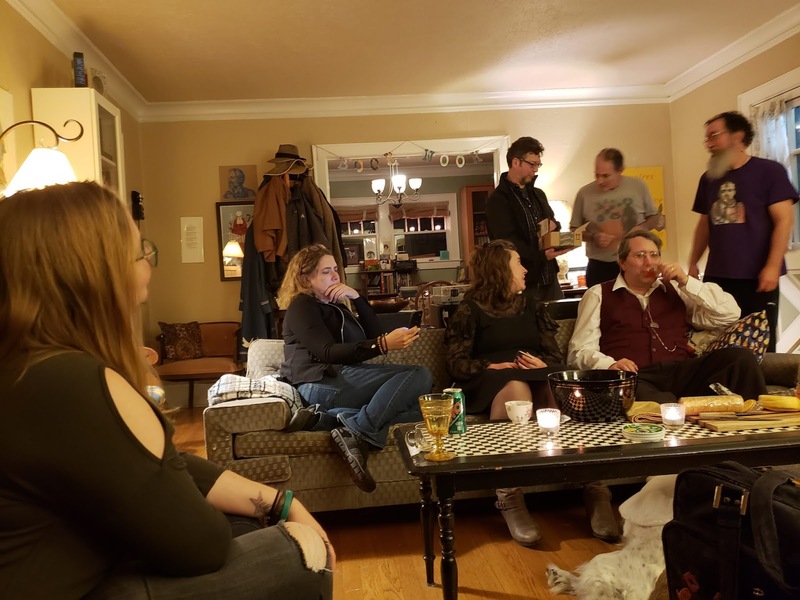 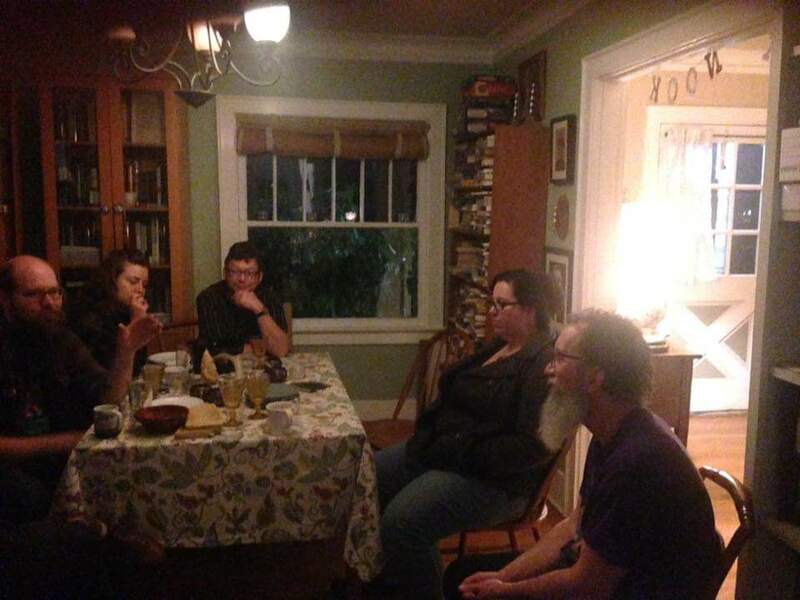 After the reading, we headed upstairs to see the rare book room and then headed to Obadiah's house for the afterparty! 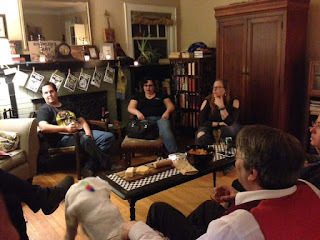 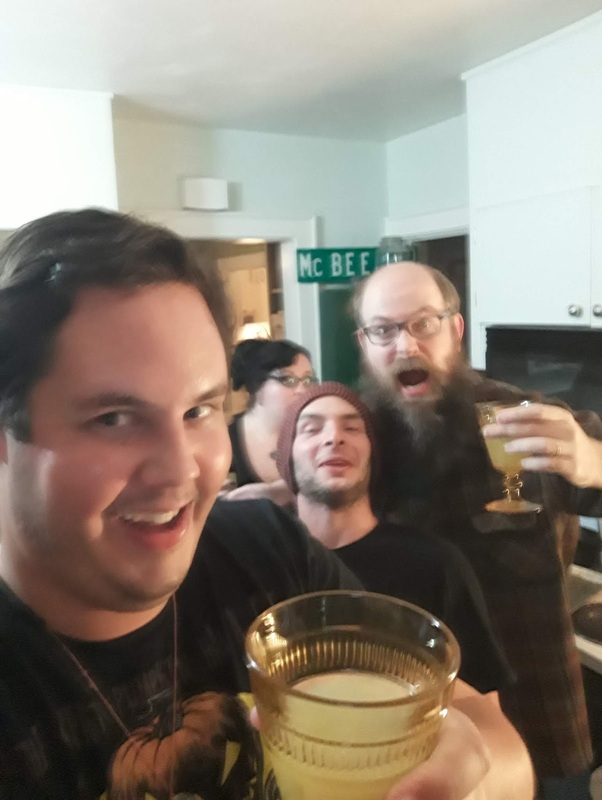 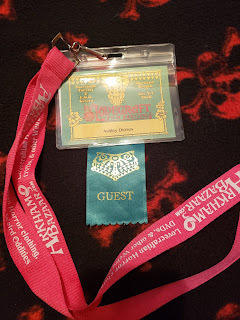 We discussed books, literary projects, and all manner of the weird over absinthe, booze, pizza, and cheese. 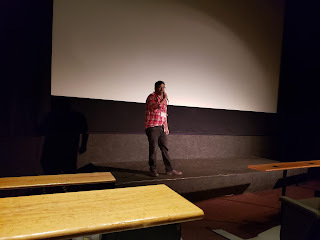 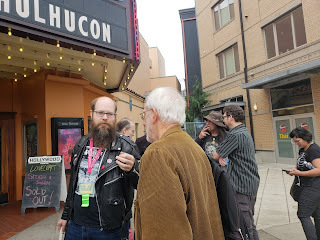 Friday was the first day of the fest and my busiest night. 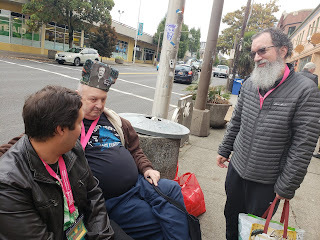 The fest ran from 7-11 and so did I. 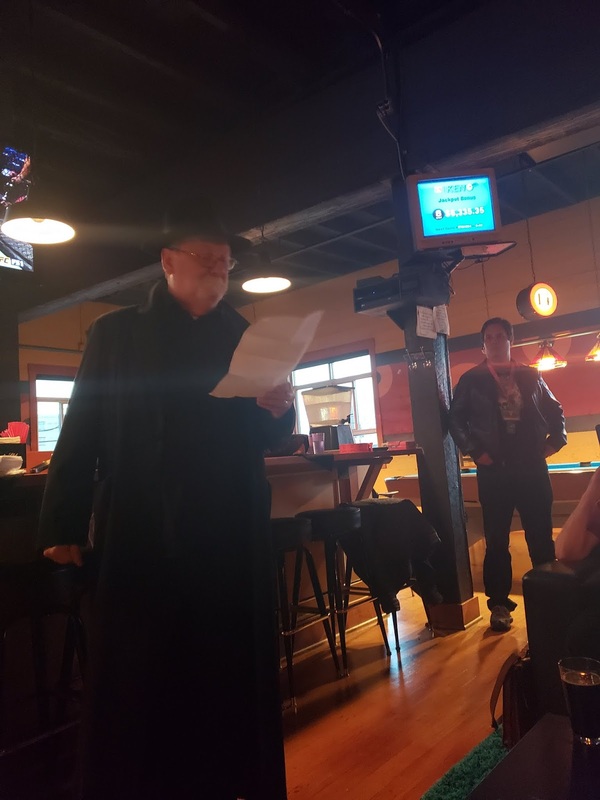 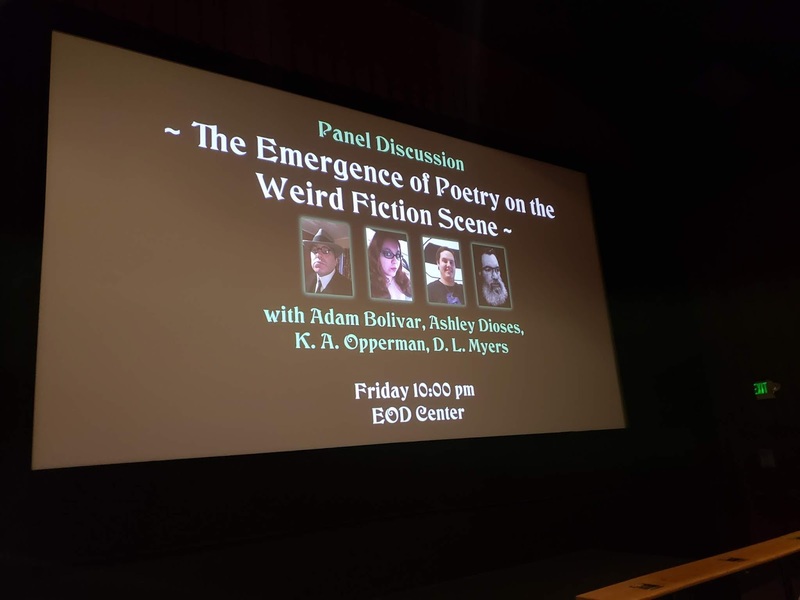 At 7, I had my reading along with Adam, Dave, and Kyle. 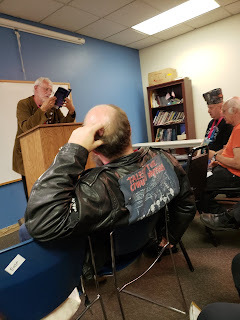 I read a couple of poems from Diary of a Sorceress but focused mainly on reading poems from The Withering. 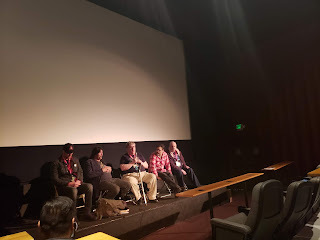 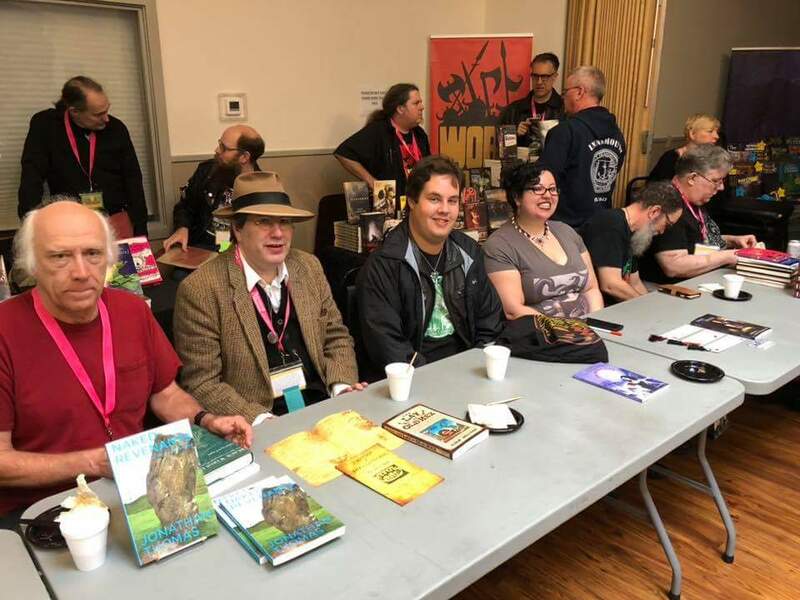 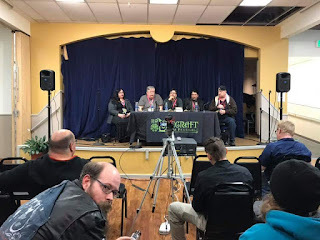 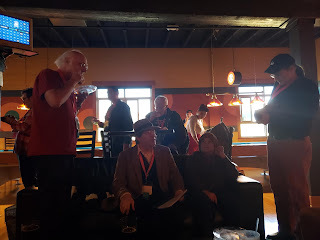 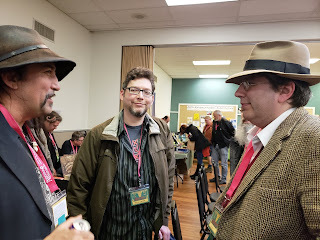 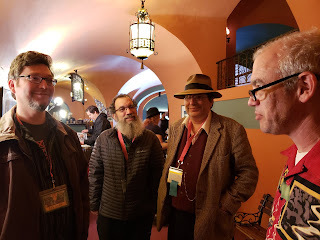 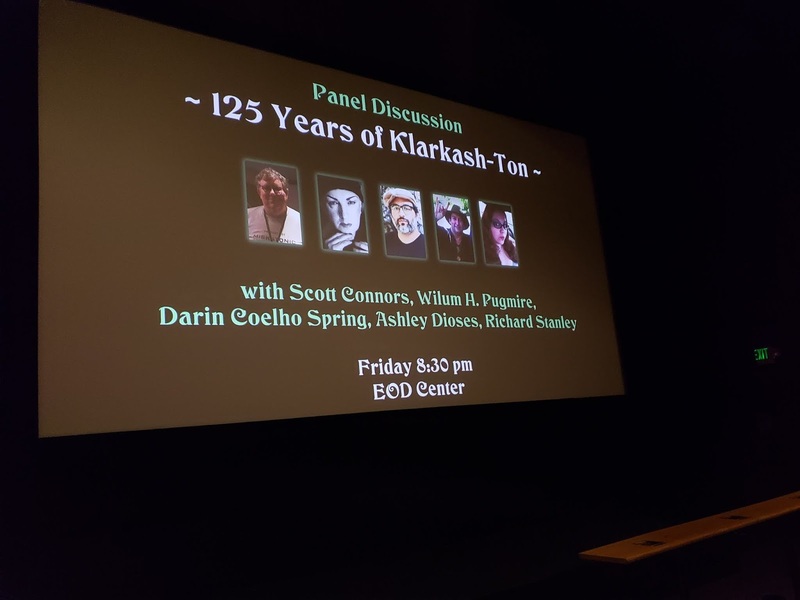 After that, there was a small break before I was on the 125 Years of Klarkash-Ton panel with Scott Connors, Darin Coehlo Springs, Richard Stanley, and Wilum Pugmire. 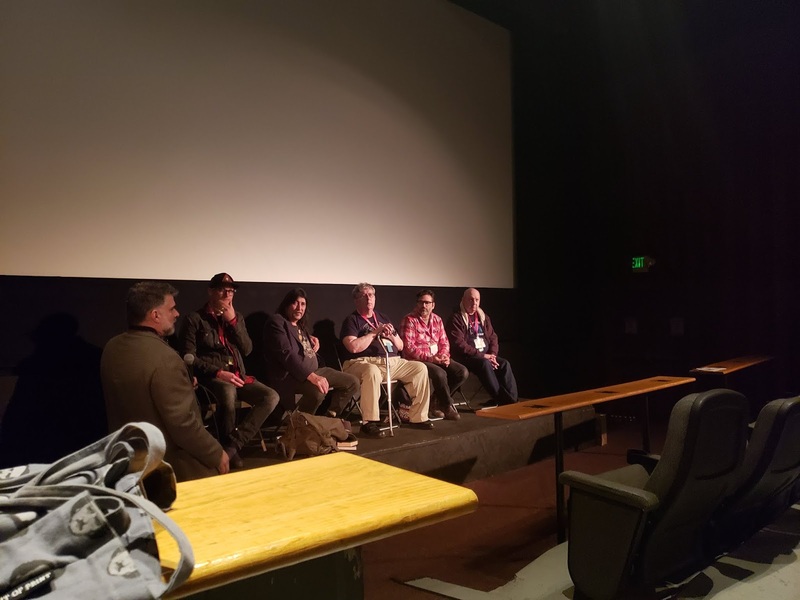 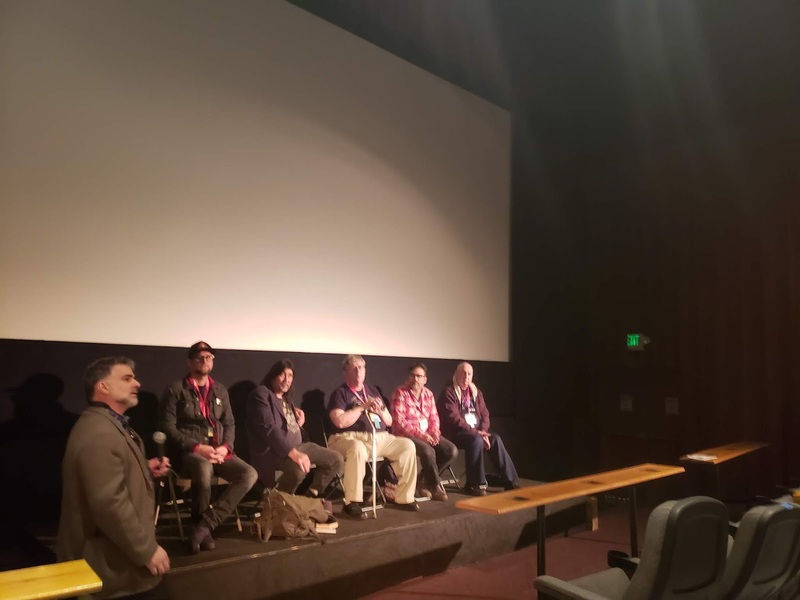 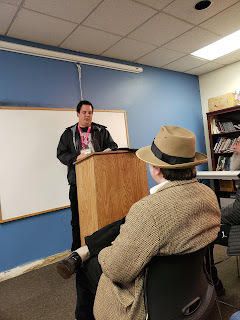 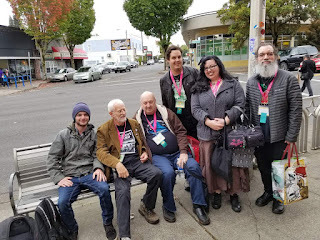 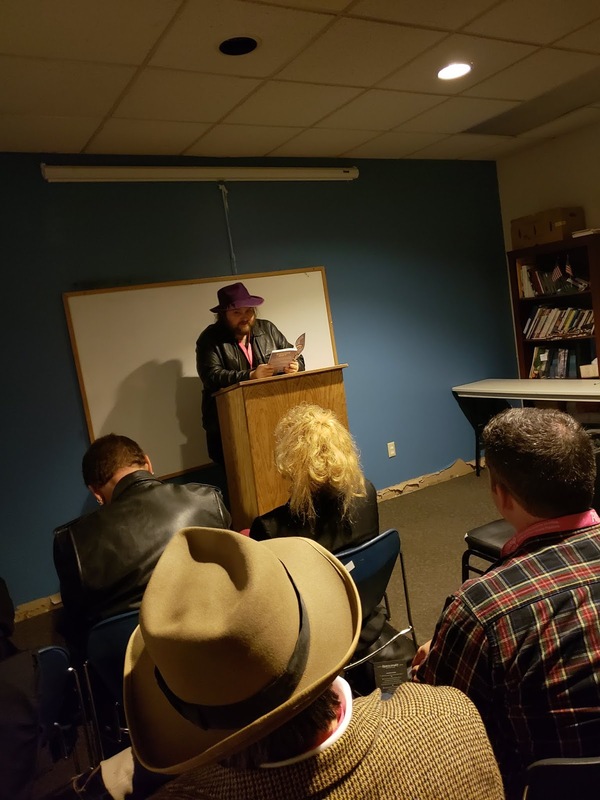 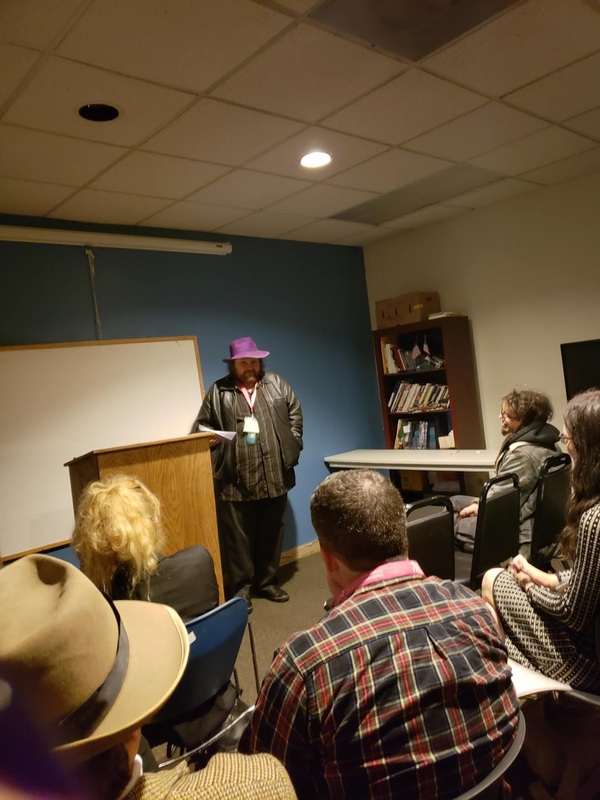 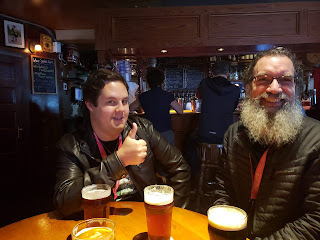 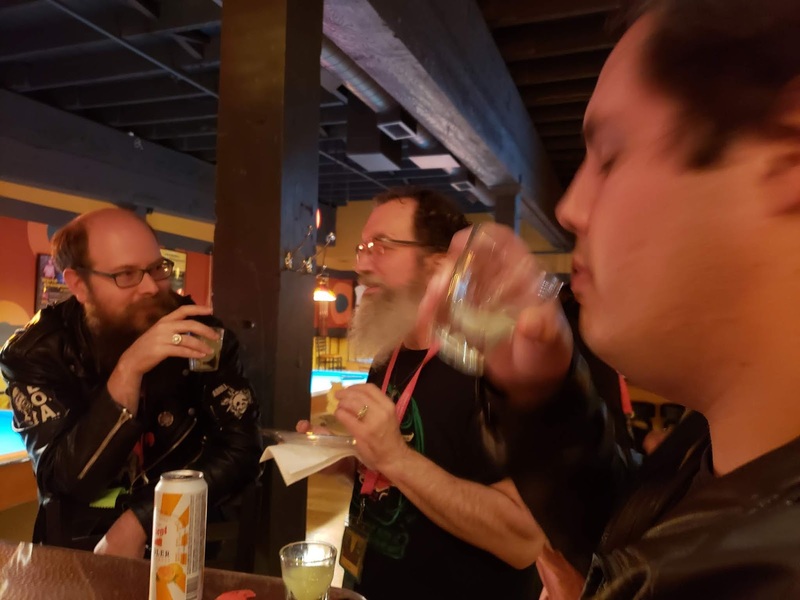 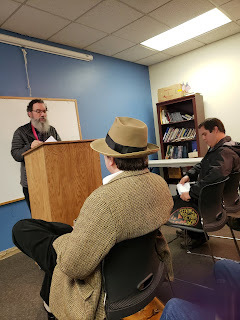 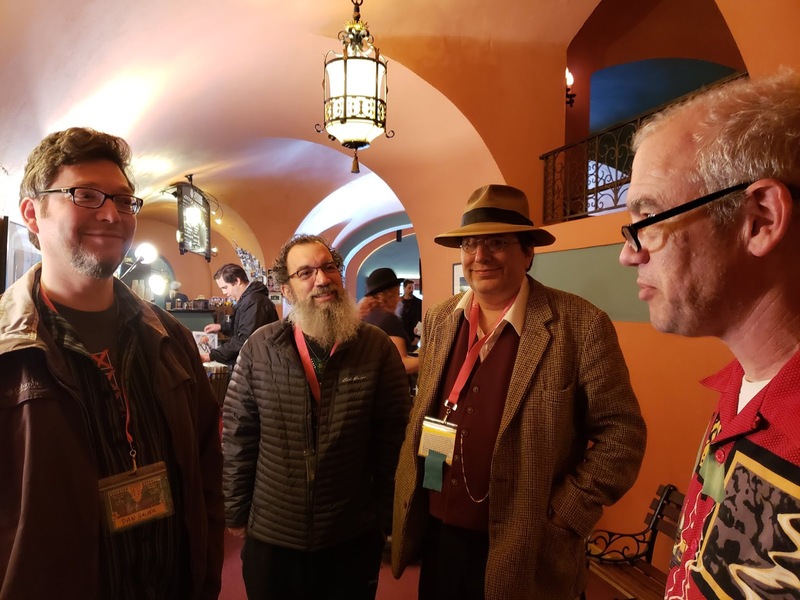 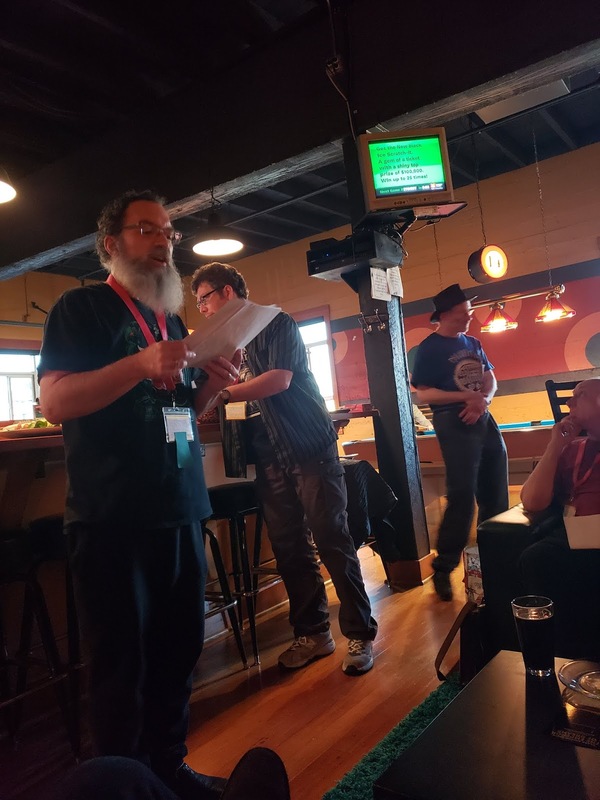 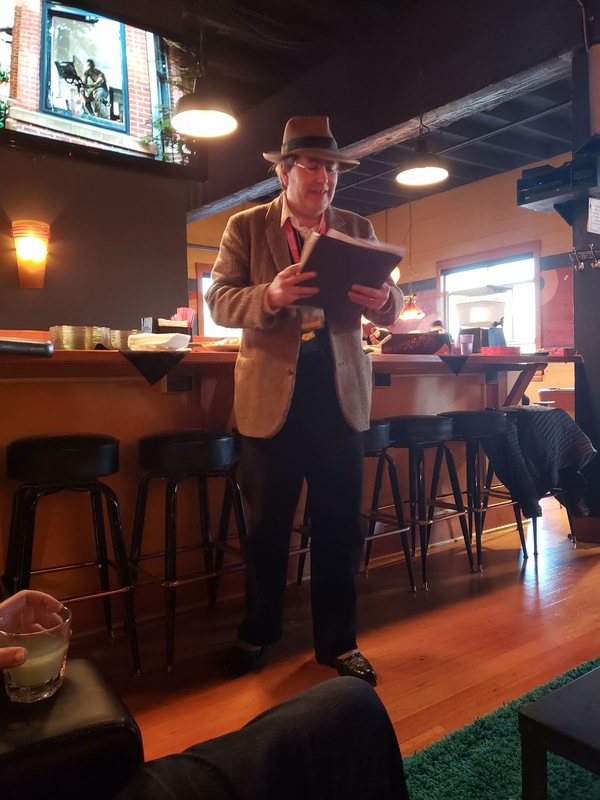 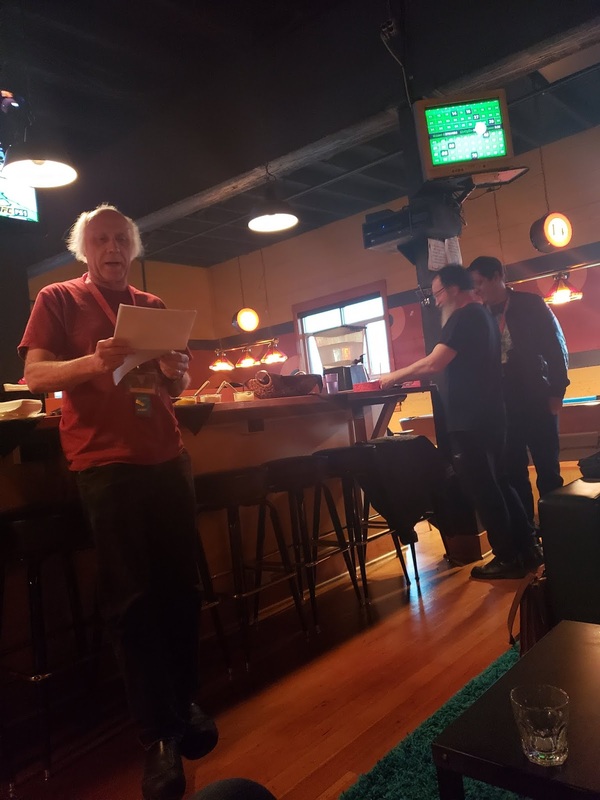 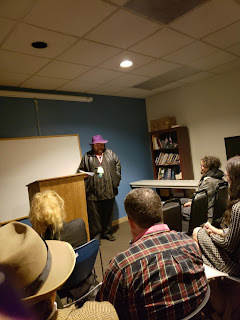 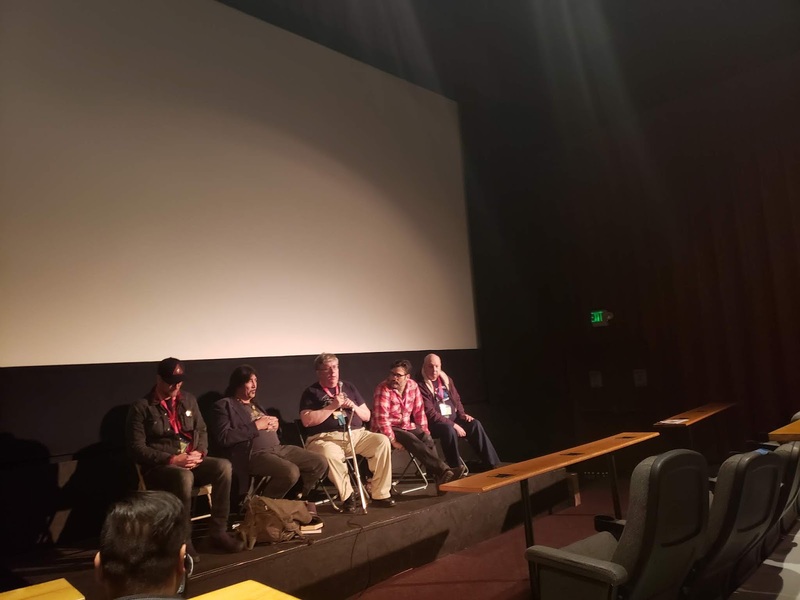 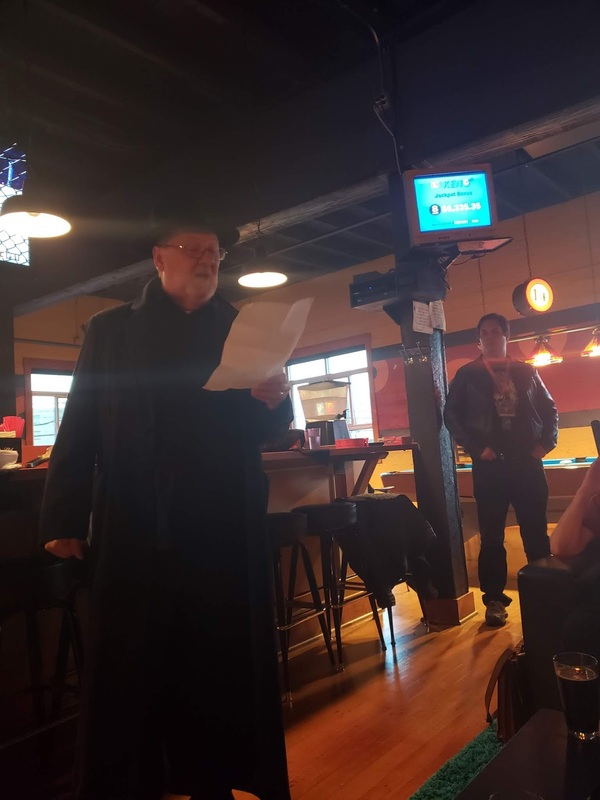 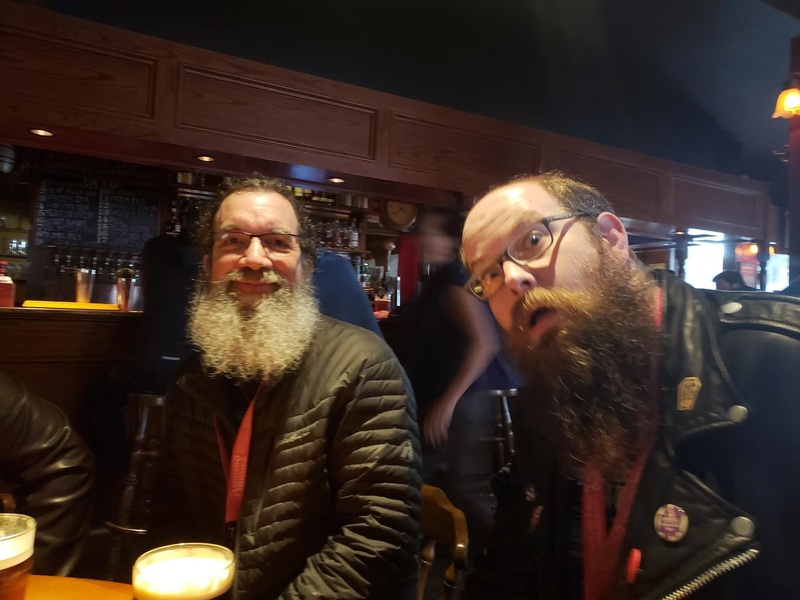 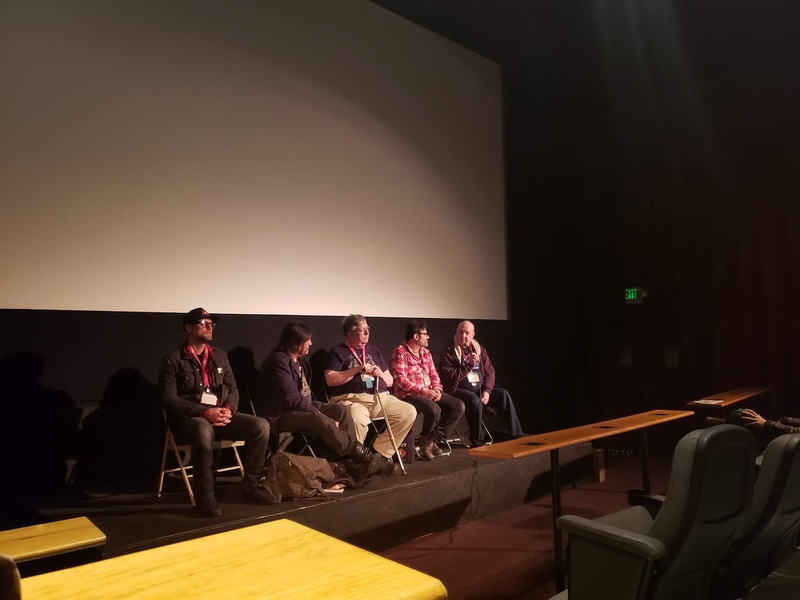 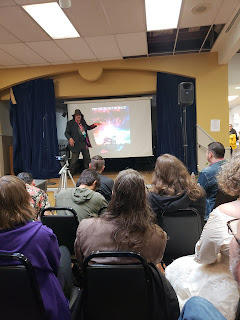 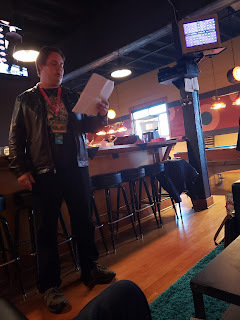 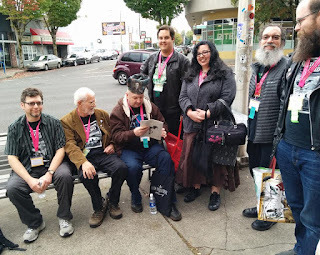 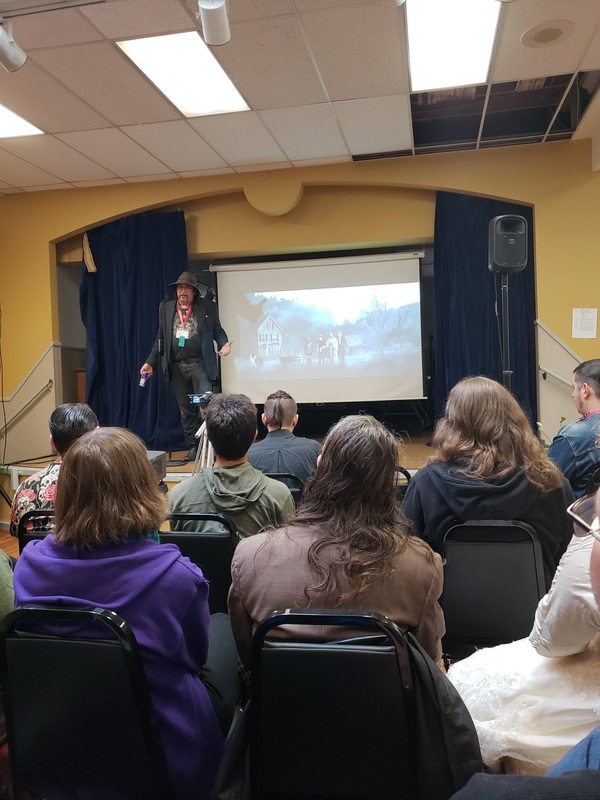 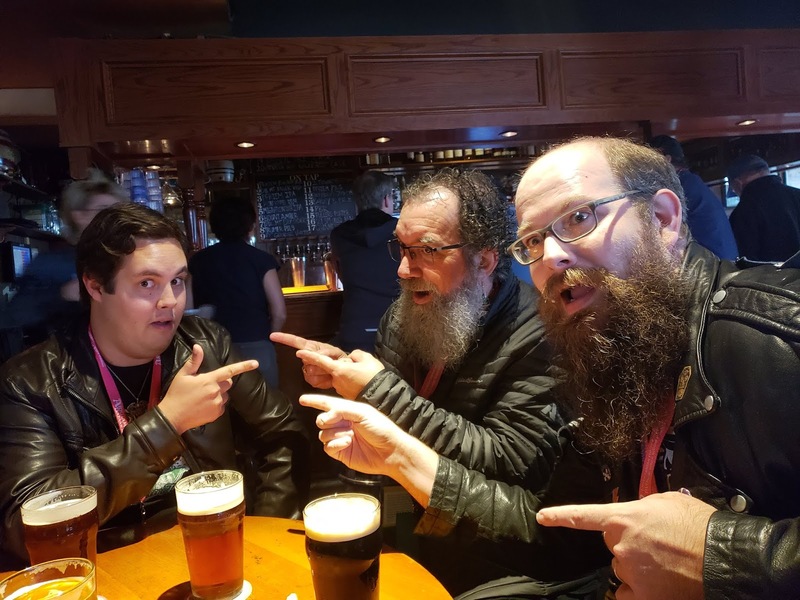 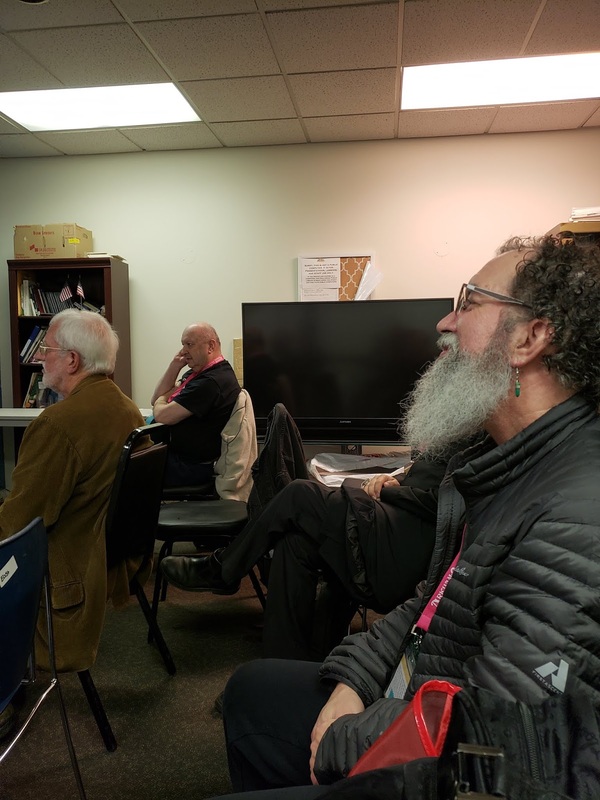 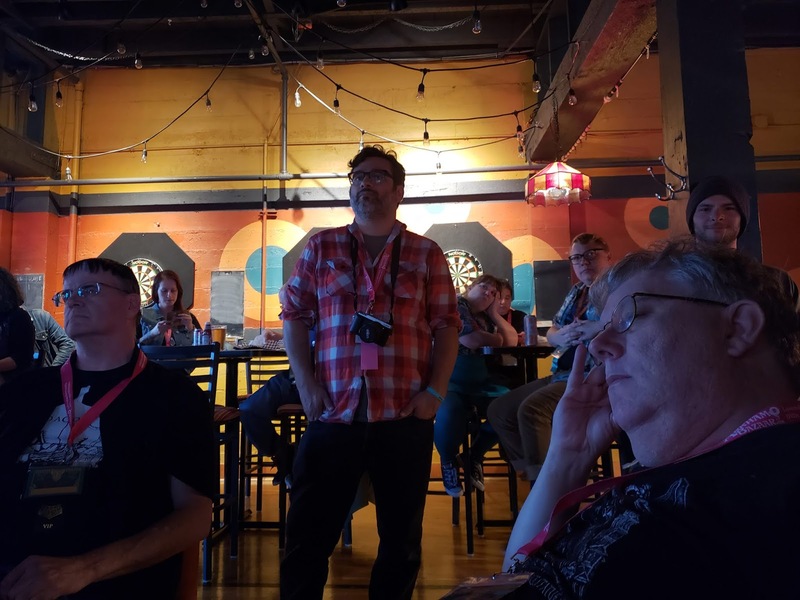 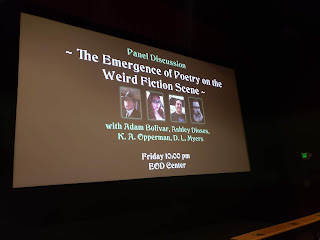 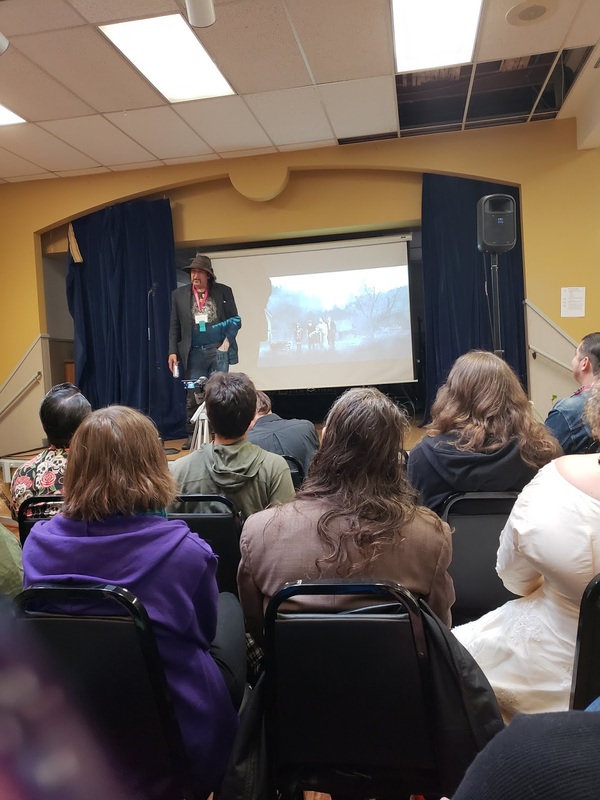 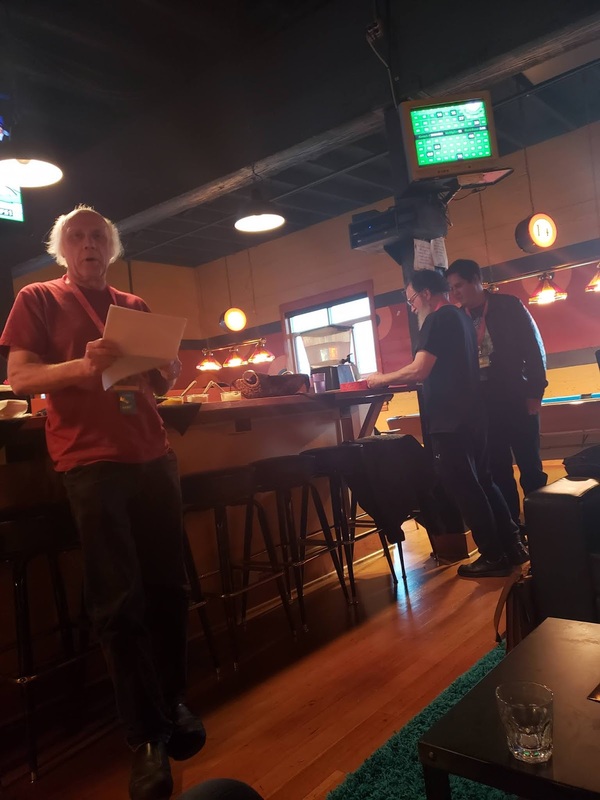 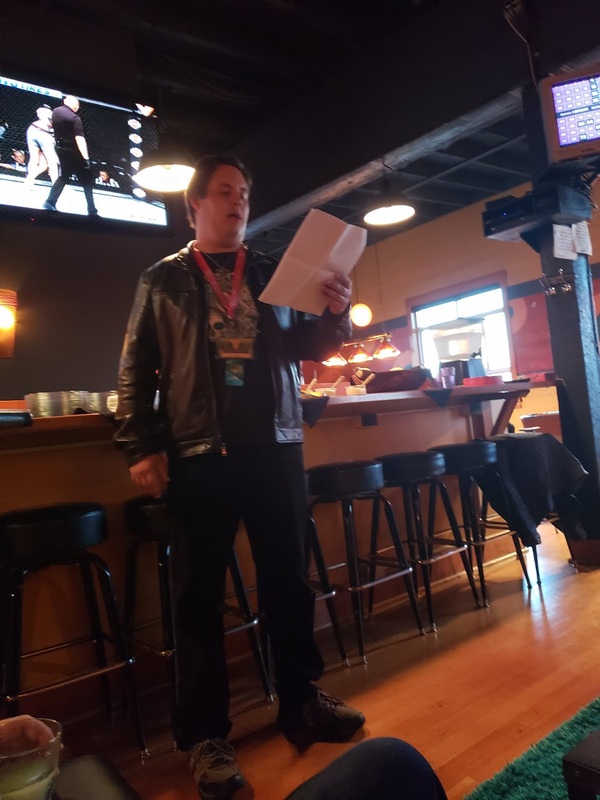 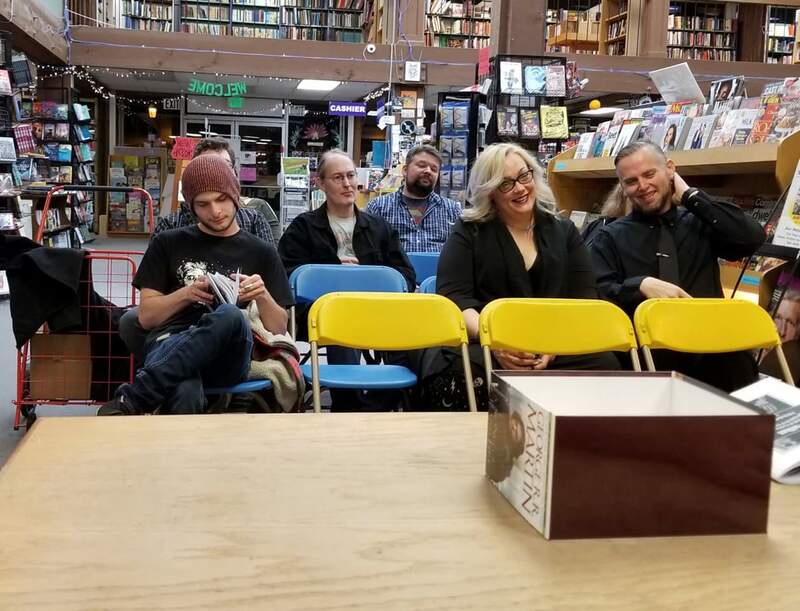 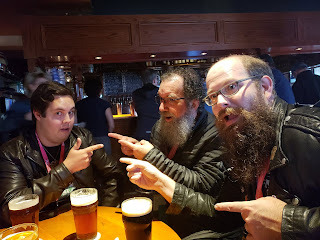 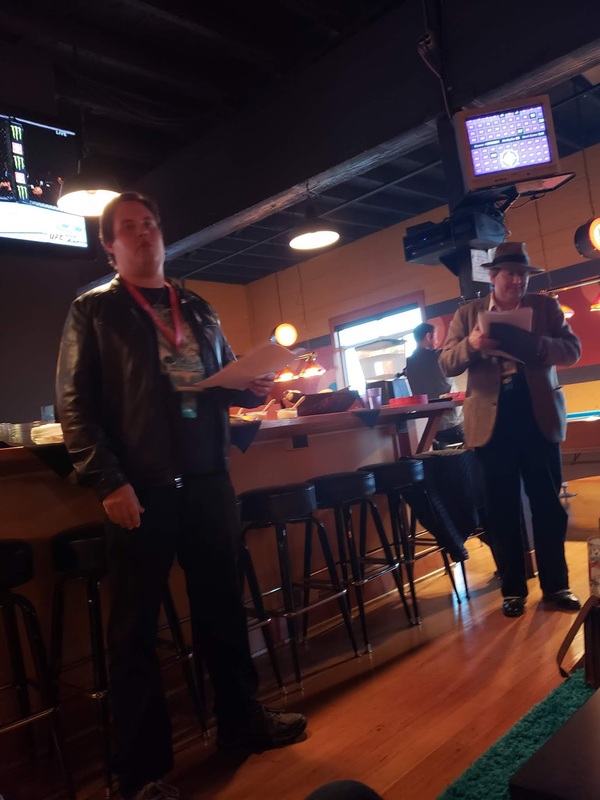 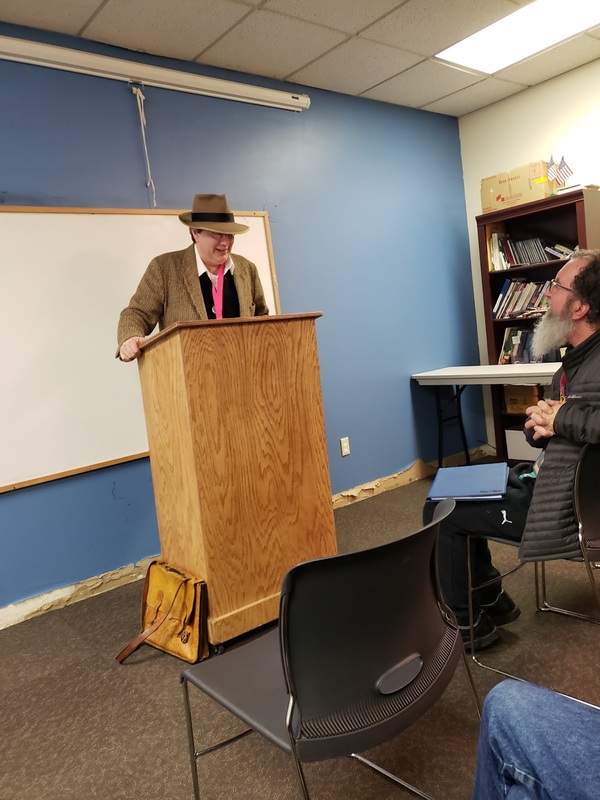 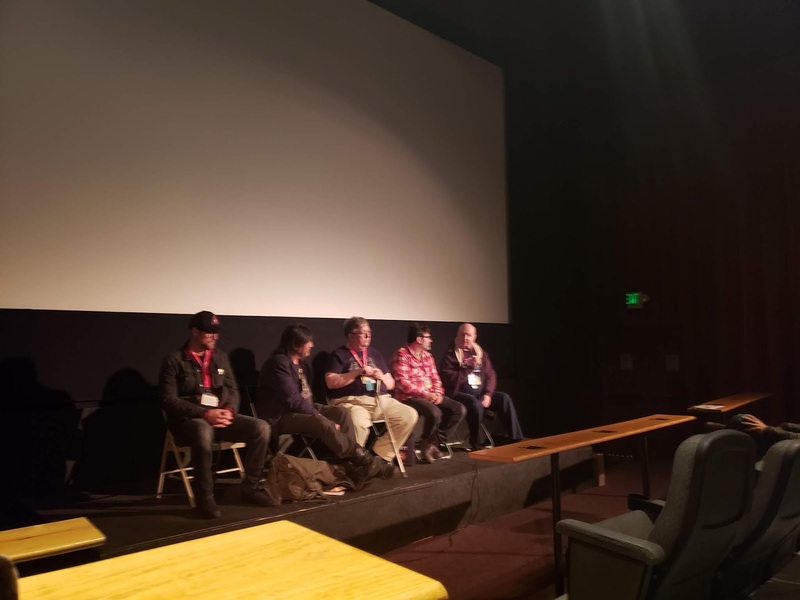 Next was the Emergence of Weird Poetry panel with The Crimson Circle (me, Kyle, Adam, and Dave) and Obadiah Baird, editor of the Audient Void. 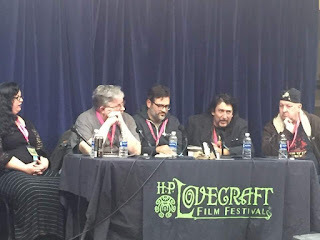 I was a bit more talkative on this panel than the last. 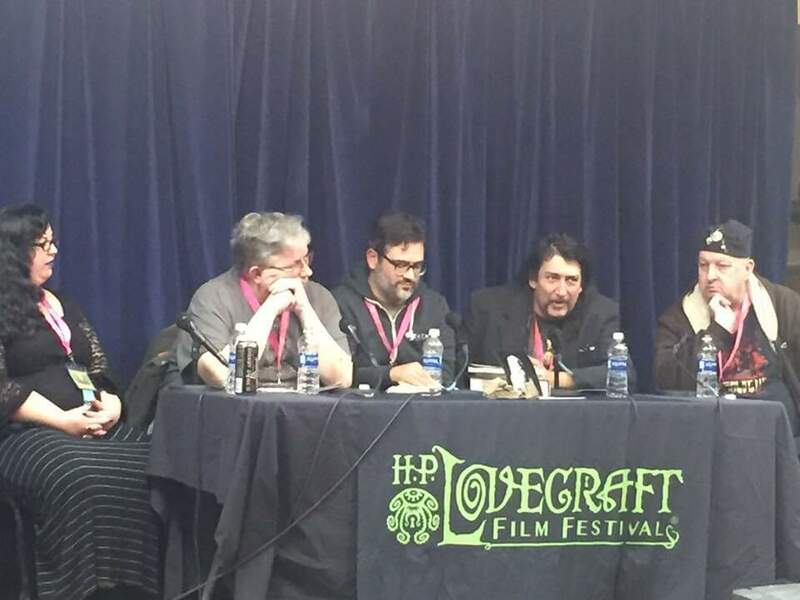 Unfortunately, this panel was not recorded like the previous panel. 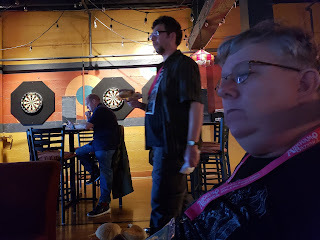 Afterward, we shopped and headed to Sam's Billiard's next door for some dinner and drinks. Saturday morning was a mass author signing which was pretty fun. 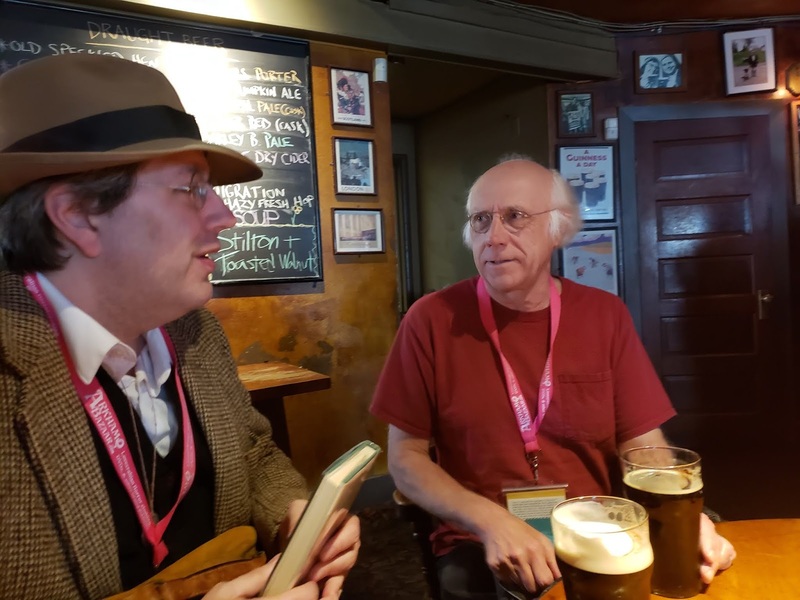 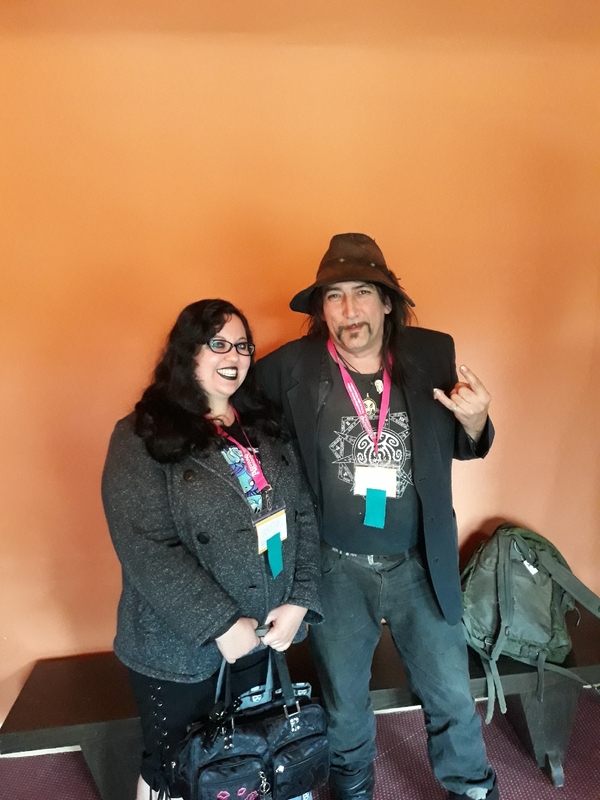 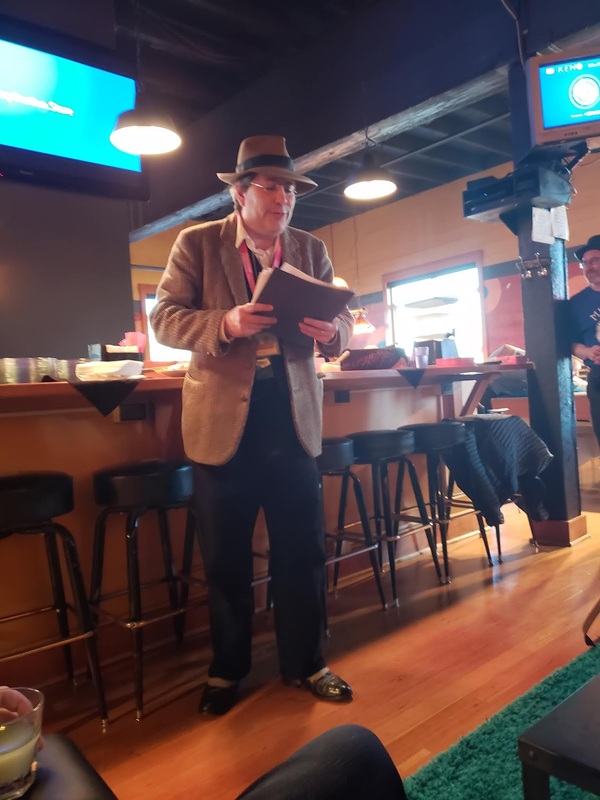 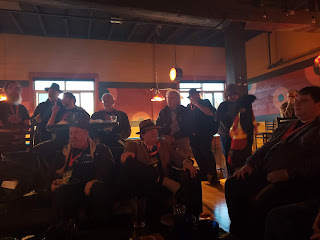 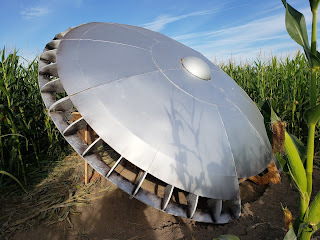 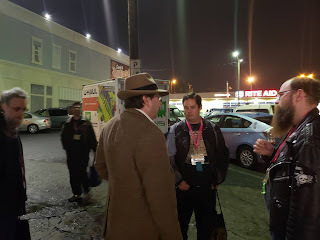 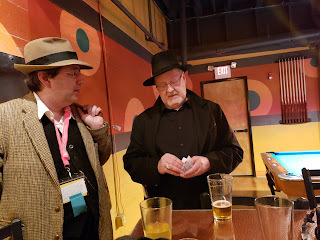 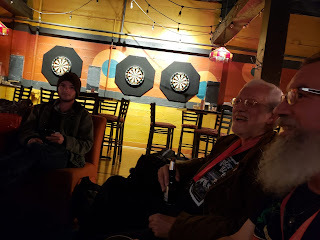 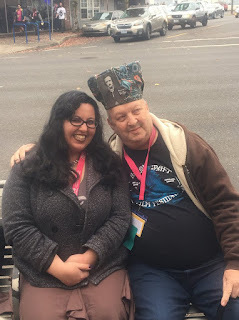 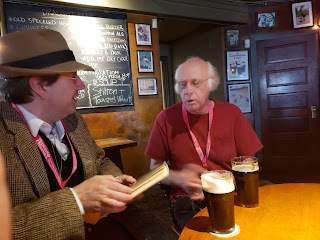 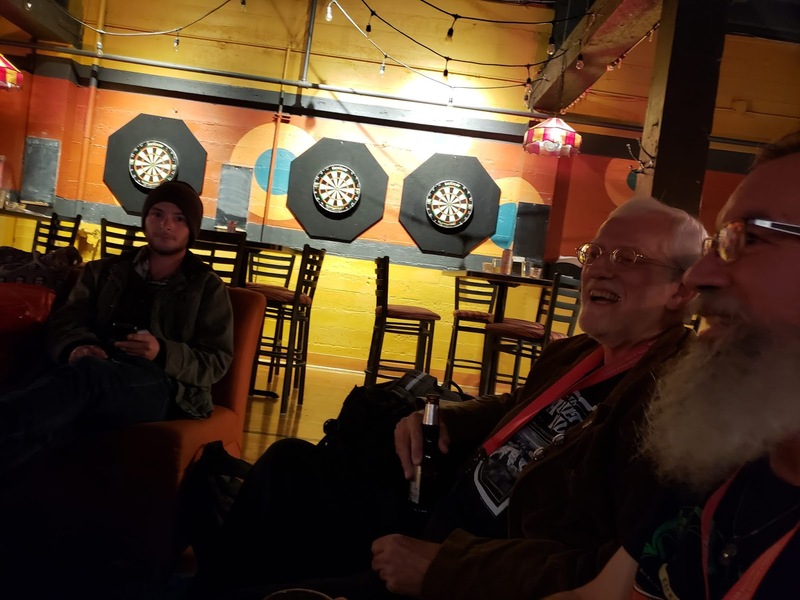 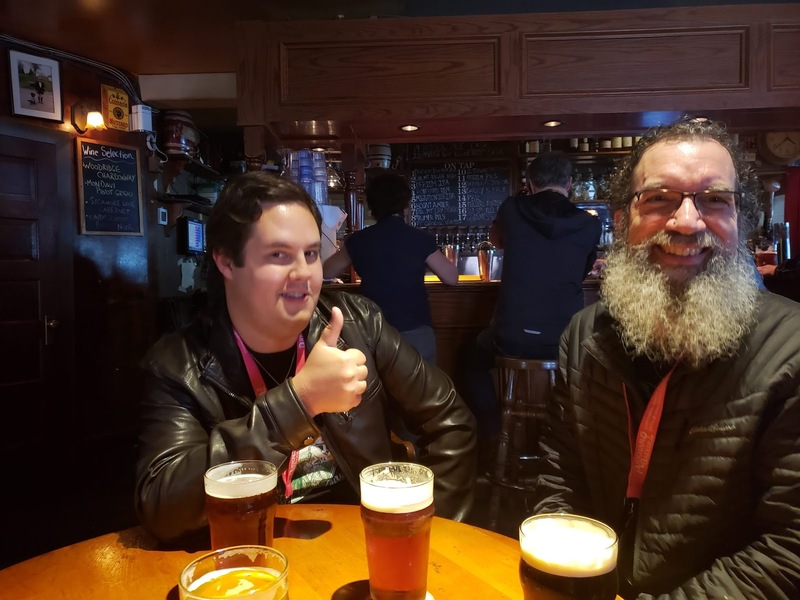 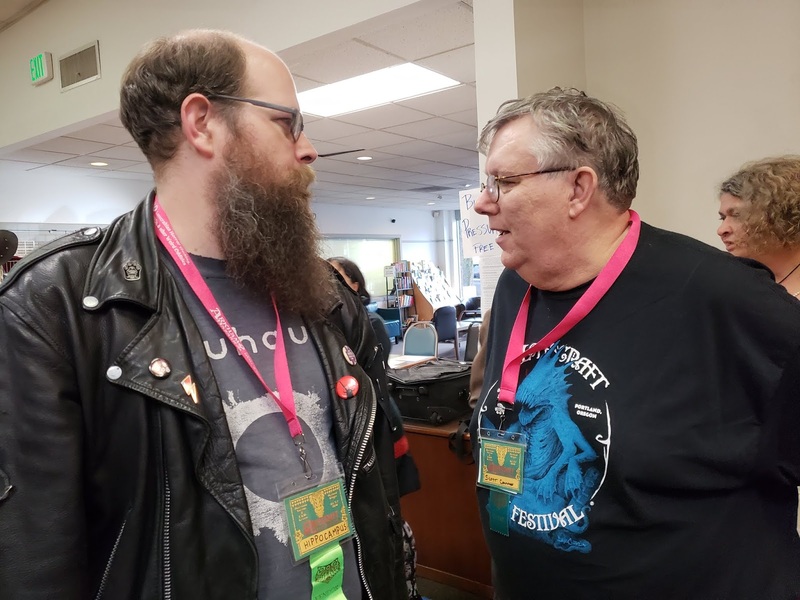 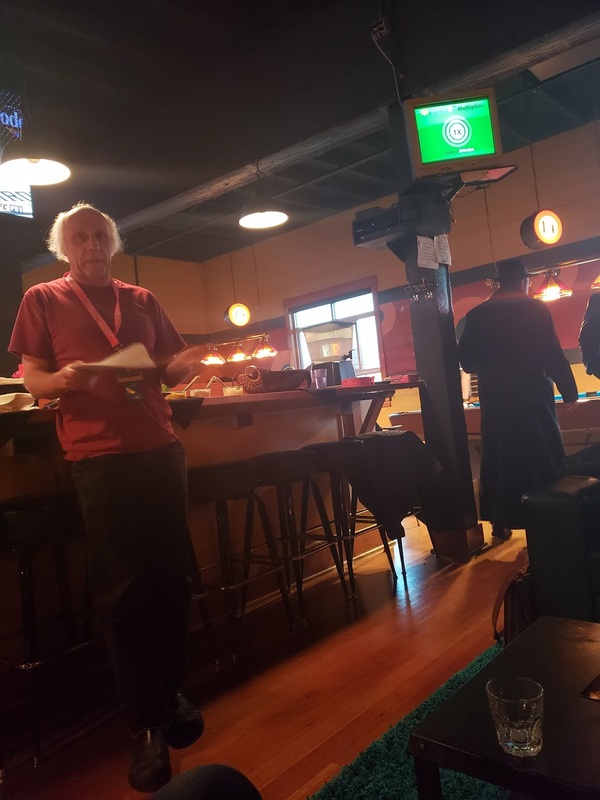 I met Ray Garton for the first time and chatted with others. 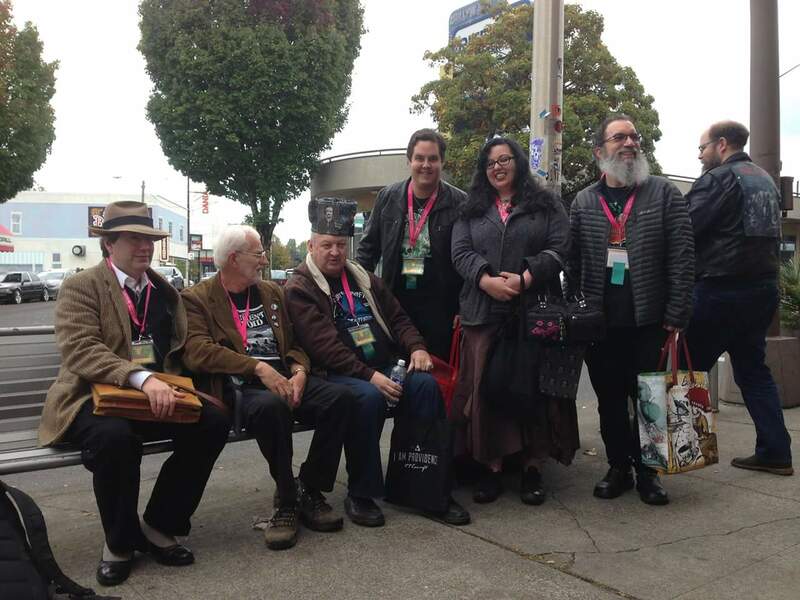 (Back row: Derrick Hussey, Obadiah, Ross E. Lockhart, and Mike Griffin. 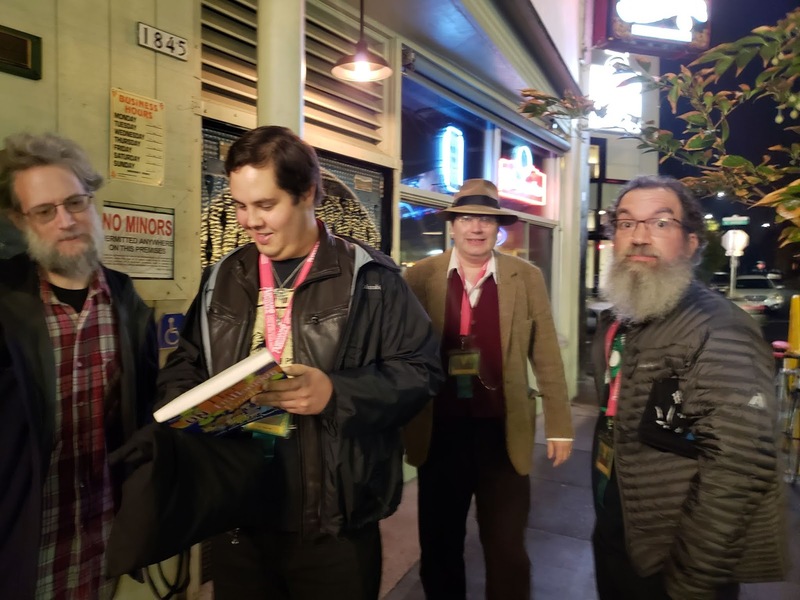 Next, we raced back to Adam's house because Dave, Kyle, and I all forgot our badges. 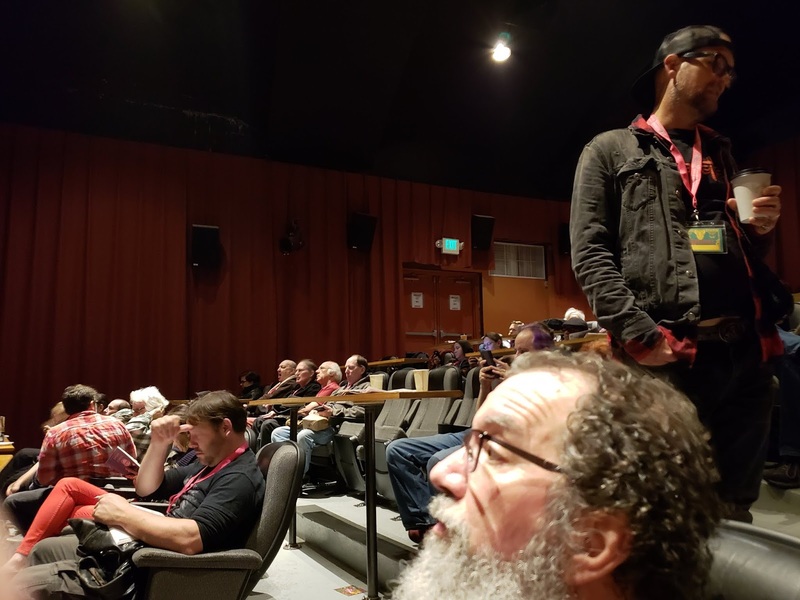 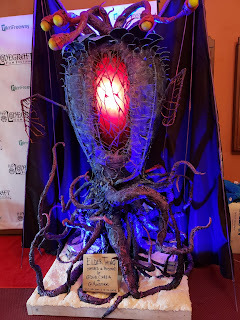 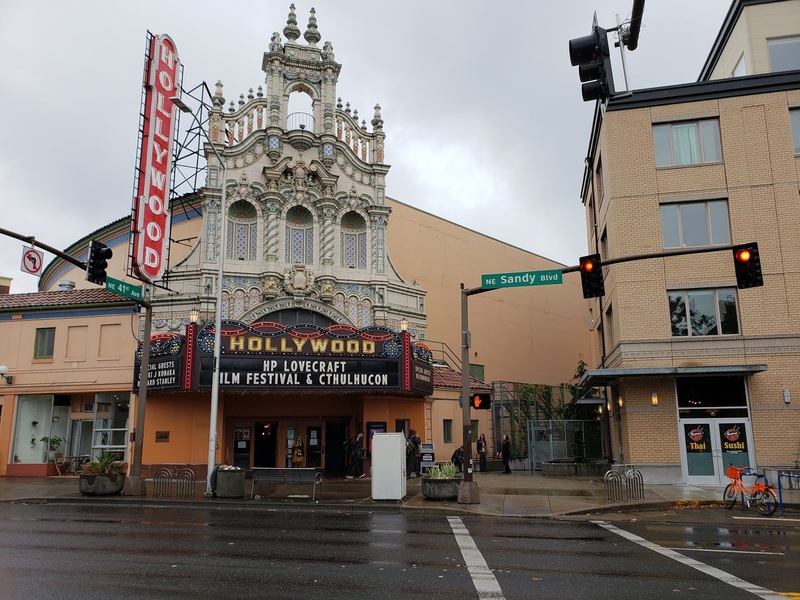 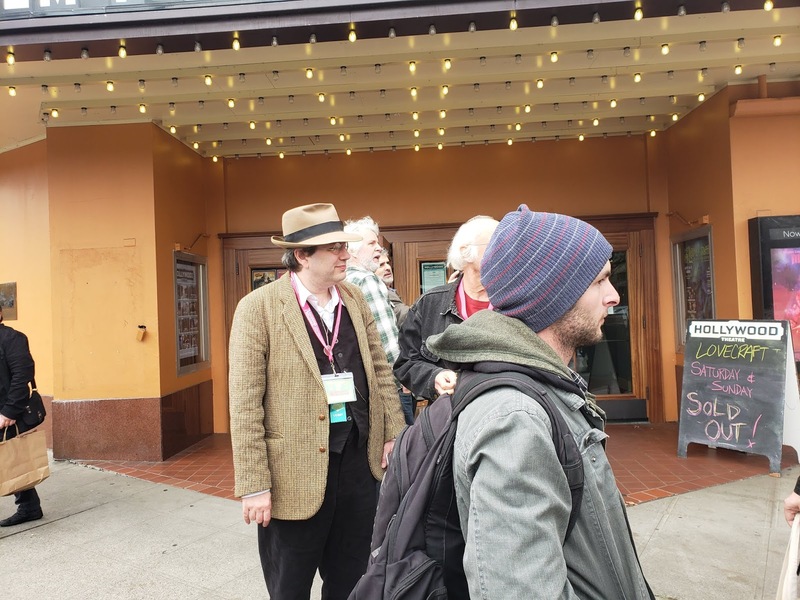 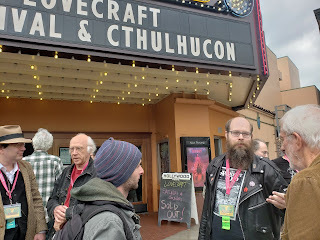 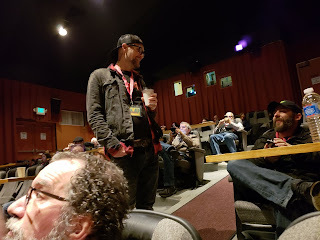 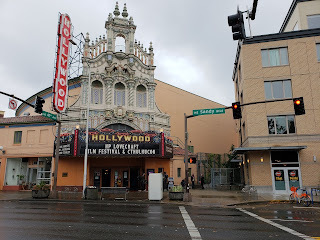 We then headed to watch the Clark Ashton Smith documentary created by Darin Coehlo Spring at the Hollywood Theater. 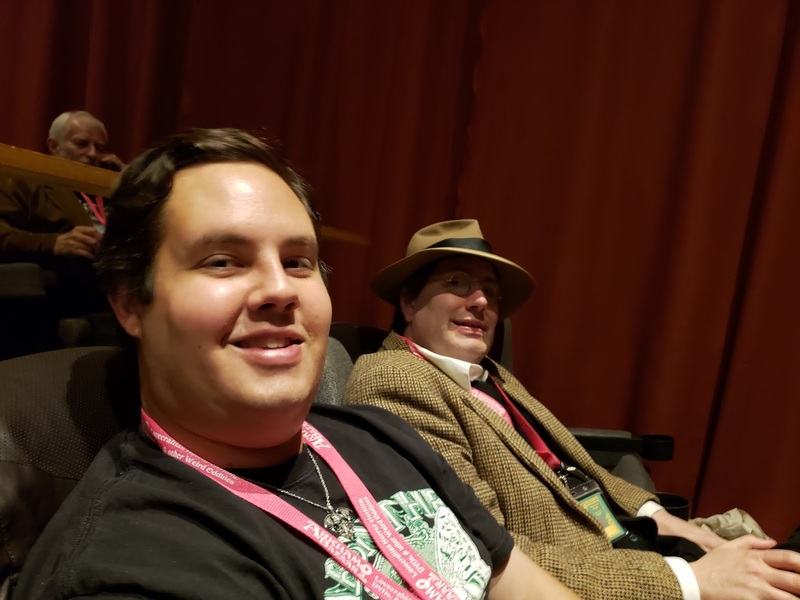 We made it in time and took our seats. The film was absolutely riveting. 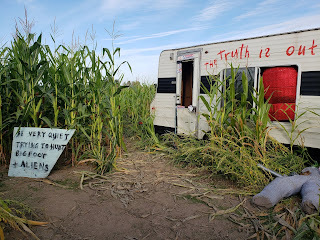 I had goosebumps watching a few parts. It was such an incredible film and I am happy that I snagged a dvd of it. 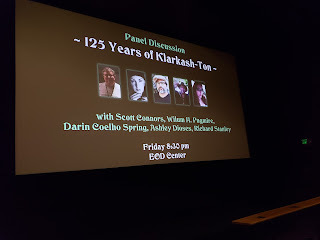 Kyle, Adam, S. T. Joshi, Harlan Ellison, Skinner, Richard Stanley, Scott Connors, Ron Hilger, Wilum Pugmire, Donald Sidney-Fryer, and others appear in this film. 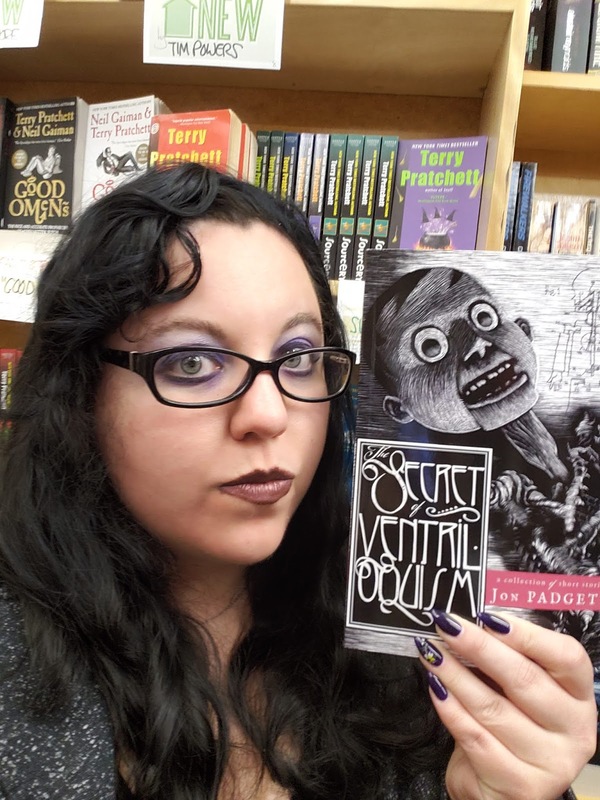 I'm in the Special Features, reading The Witch with Eyes of Amber. 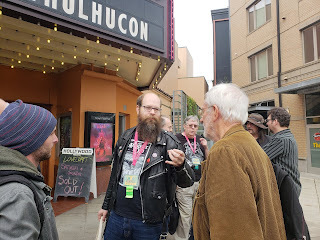 This film was released at this fest but is currently unavailable to the public. It will soon be released to the public on the Hippocampus Press site, so keep an eye out for it. 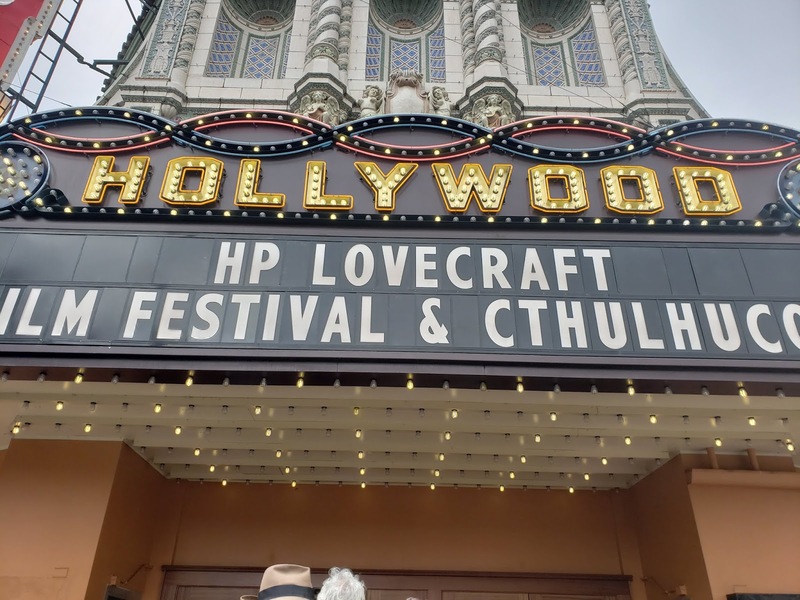 It is also on Blue-Ray. After the film, there was a Q & A with some of the participants. 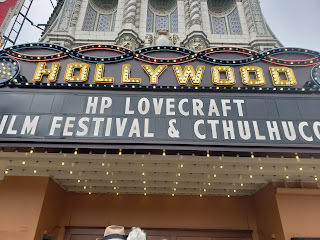 We exited the theater to see David Barker and Wilum Pugmire, who I have not met yet, sitting on a bench. 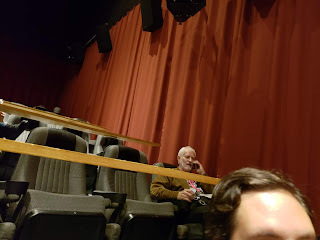 I shook his hand and took pictures with him. I tried not to fan girl and faint. 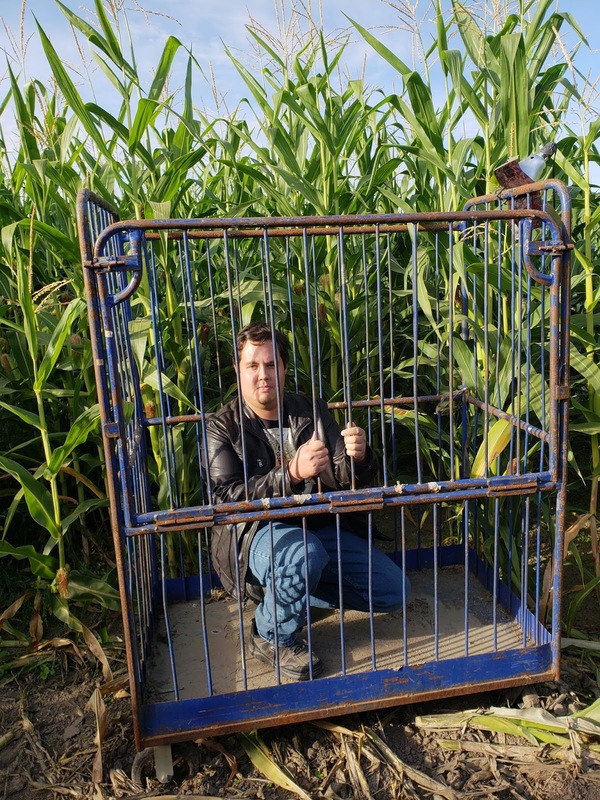 I think it worked. 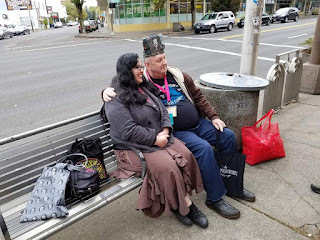 After this, we headed for a quick bite to eat at the Moon and Sixpence before we headed to the Hippocampus Happy Hour. 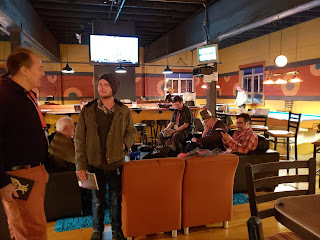 Then we dashed to Sam's Billiards for the Hippocampus Happy hour. 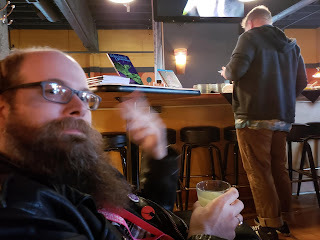 I got some absinthe and sat down to watch Adam, Kyle, and Dave before I was up. 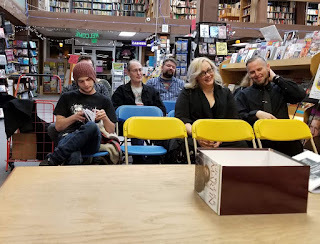 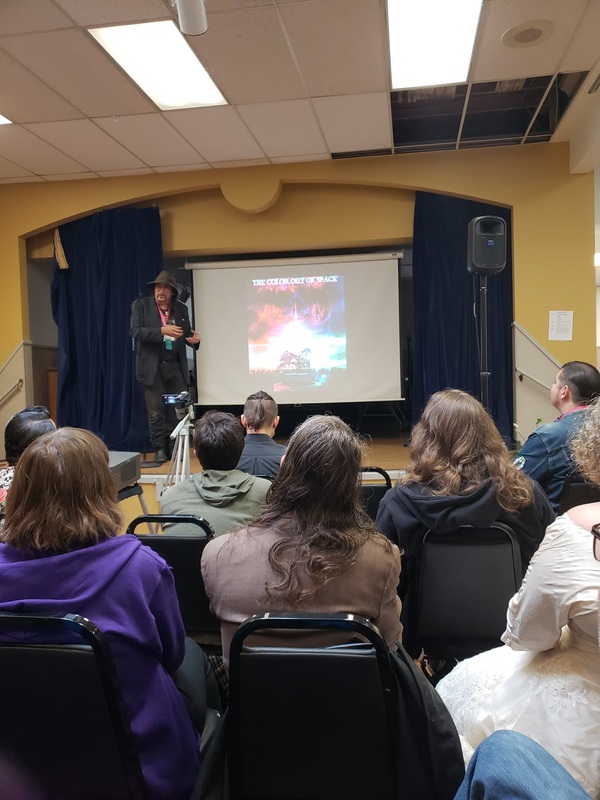 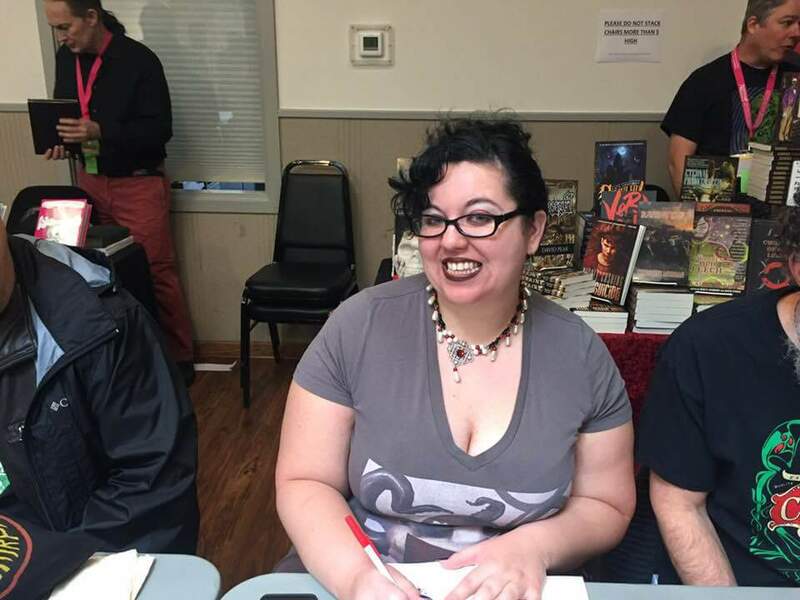 To celebrate the release of Witches and Dreamland written by Wilum Pugmire and David Barker, I read On a Dreamland's Moon, which was a bit bold and a few people were enthralled by it's...spiciness. 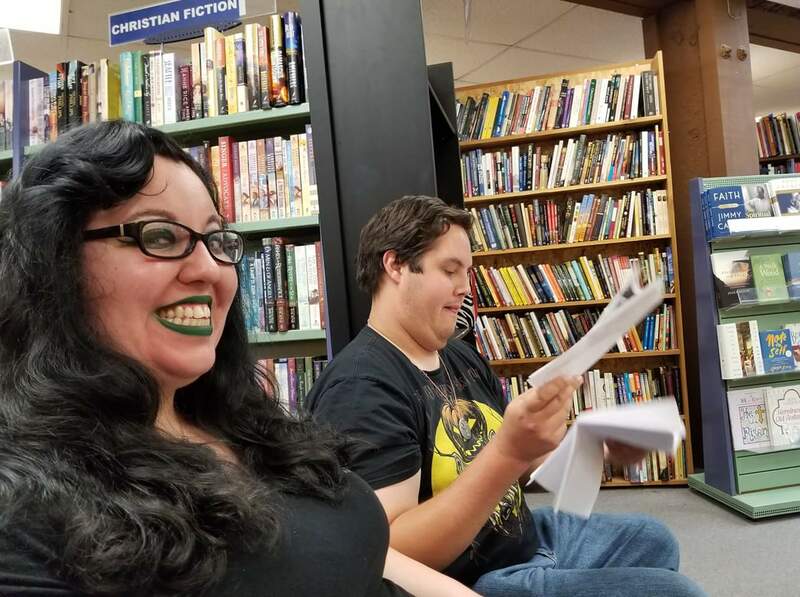 I also read Pale Radiance from The Withering and The Power of the Moon from Diary of a Vampyress. 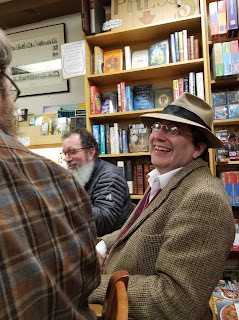 John Shirley and Jonathan Thomas read next and afterward, we just hung out eating cold cuts and drinking. I then asked Wilum Pugmire if he could sign my massive stacks of books. 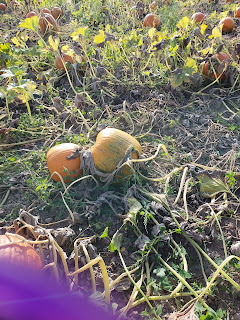 And churn a poison green. Dave, Blaine, and I were the last to leave for most everyone else went to see Necronomidol. 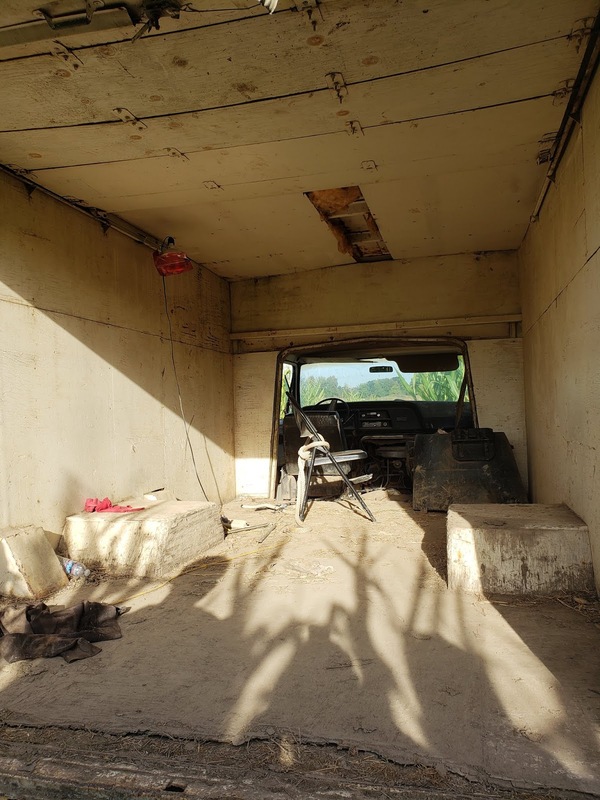 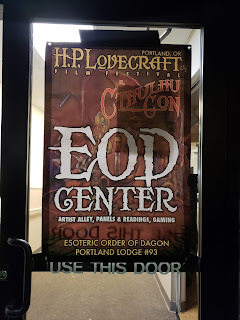 We headed back to the EOD center thoroughly intoxicated and feeling great. 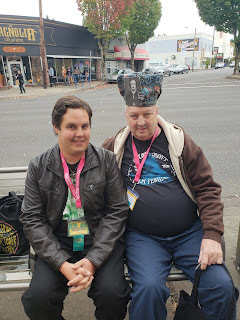 I had to ask Derrick three times what deal we were making in order for me to get What is Anything? 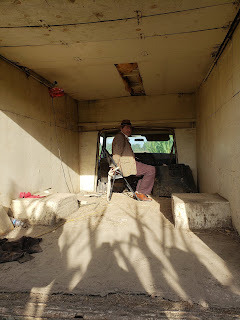 by S. T. Joshi. Well, I sold those bookmarks I brought! 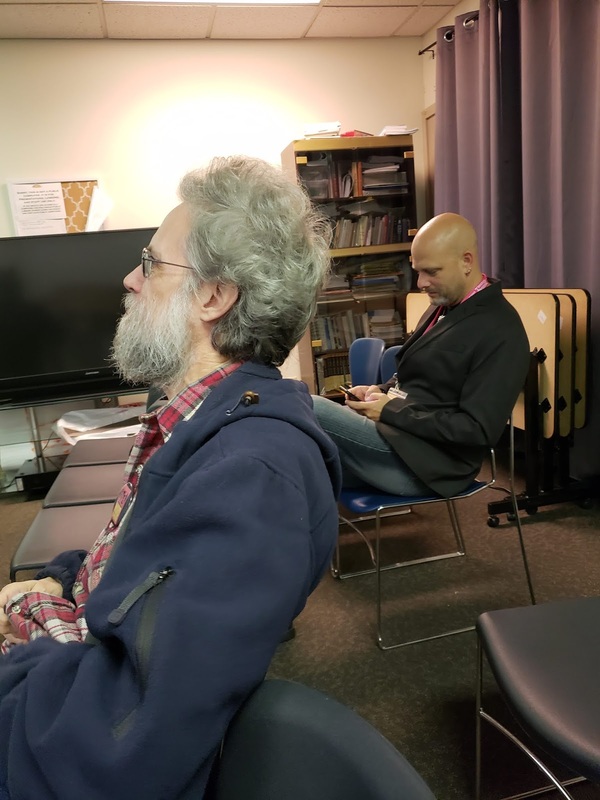 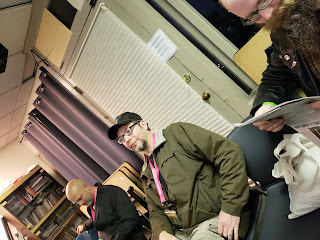 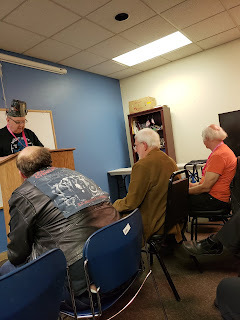 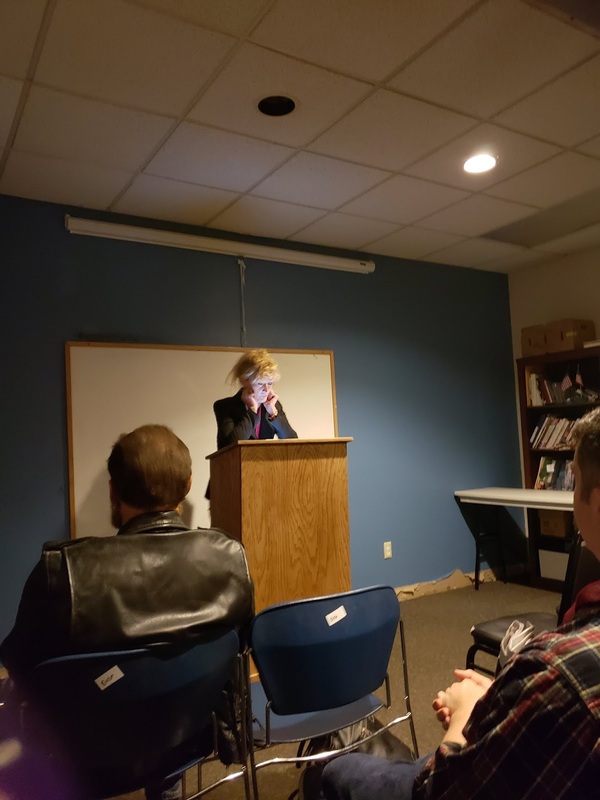 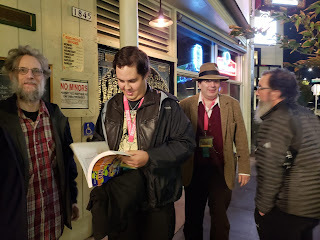 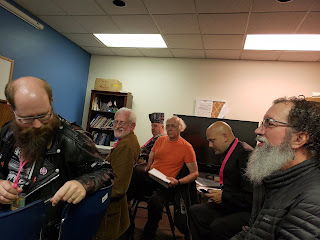 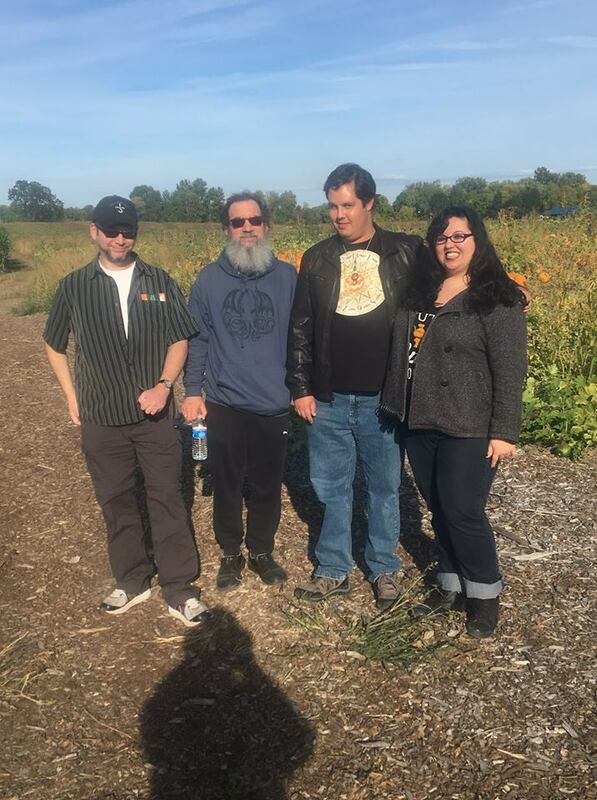 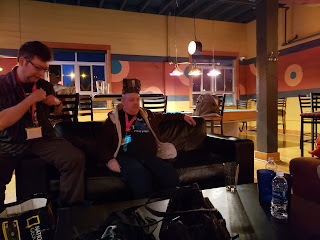 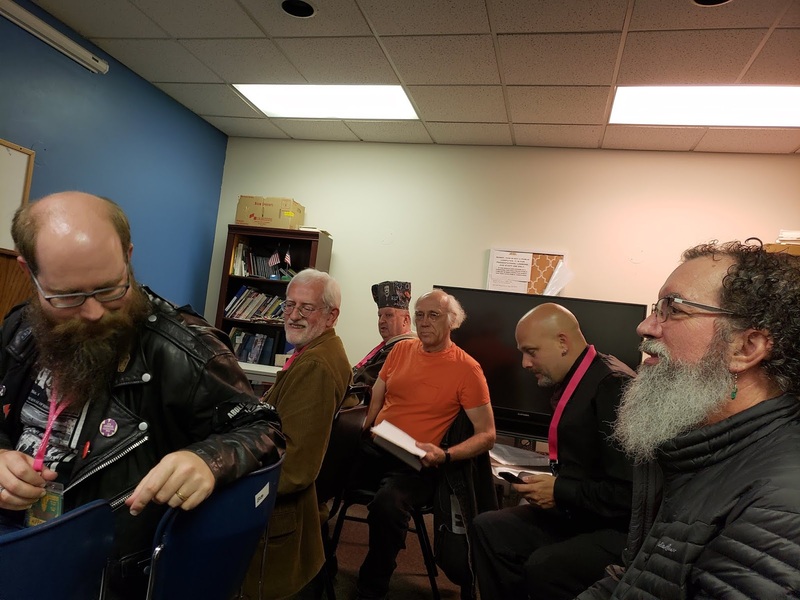 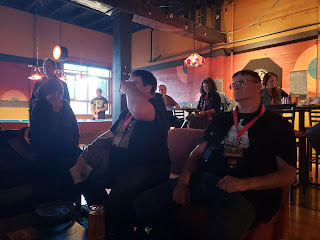 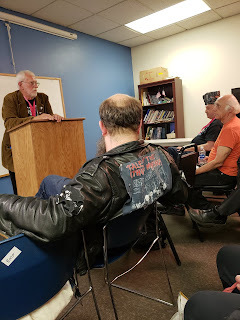 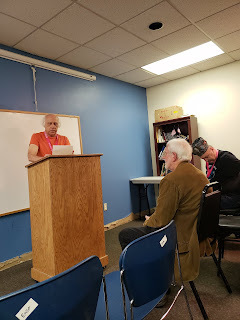 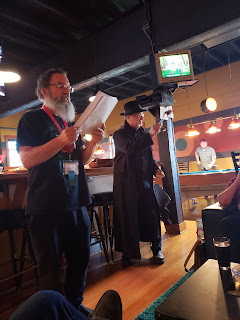 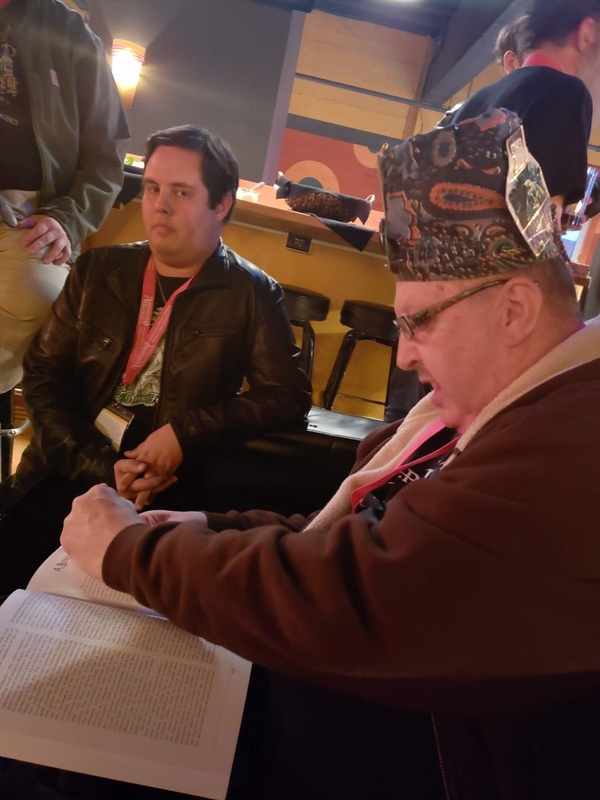 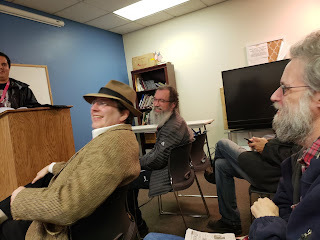 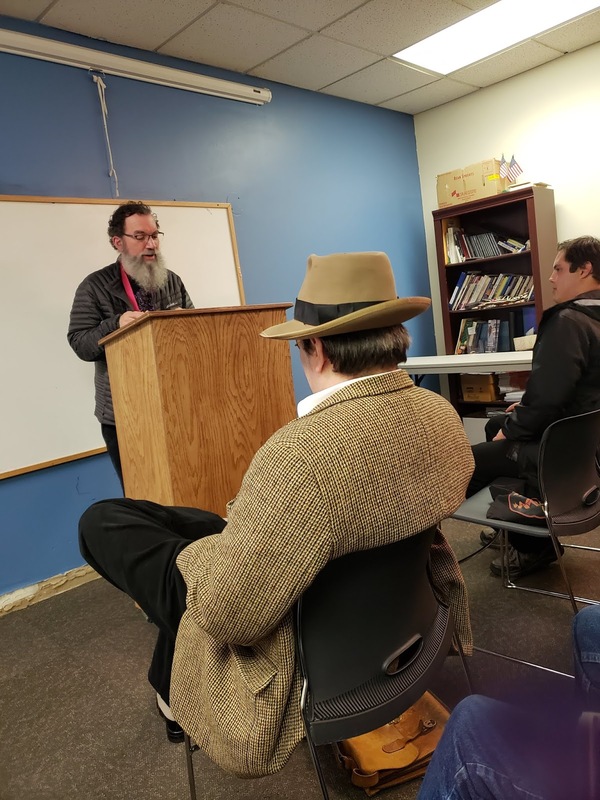 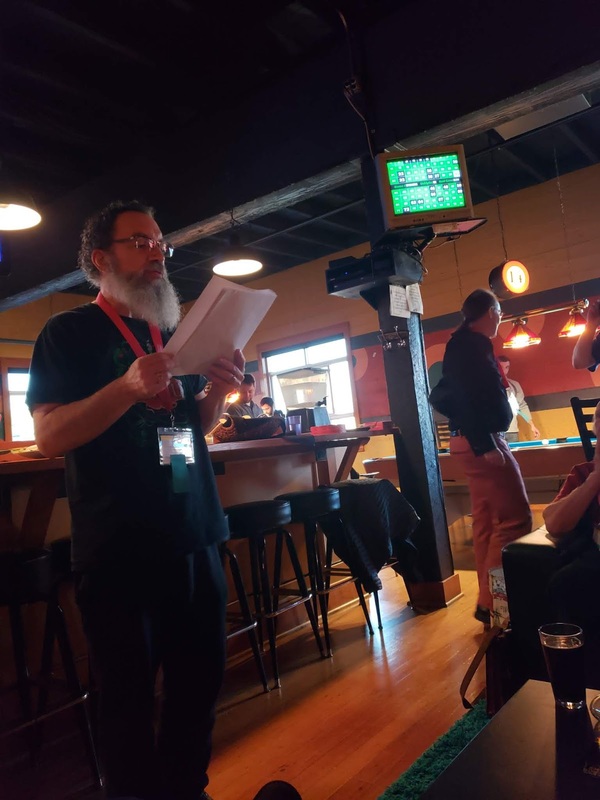 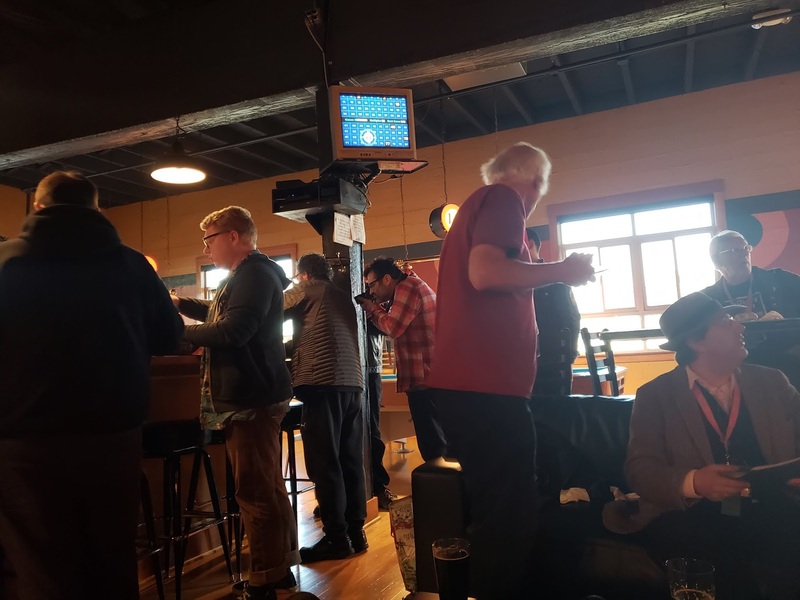 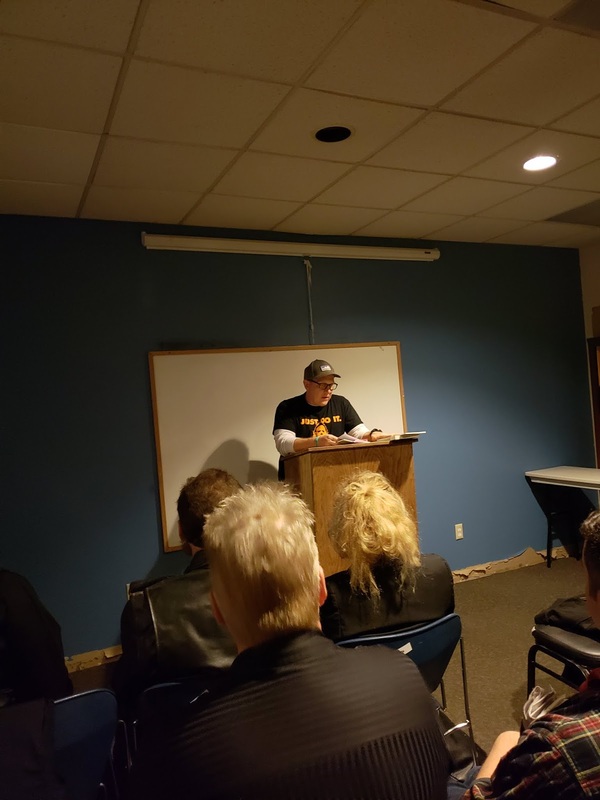 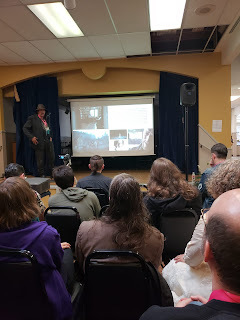 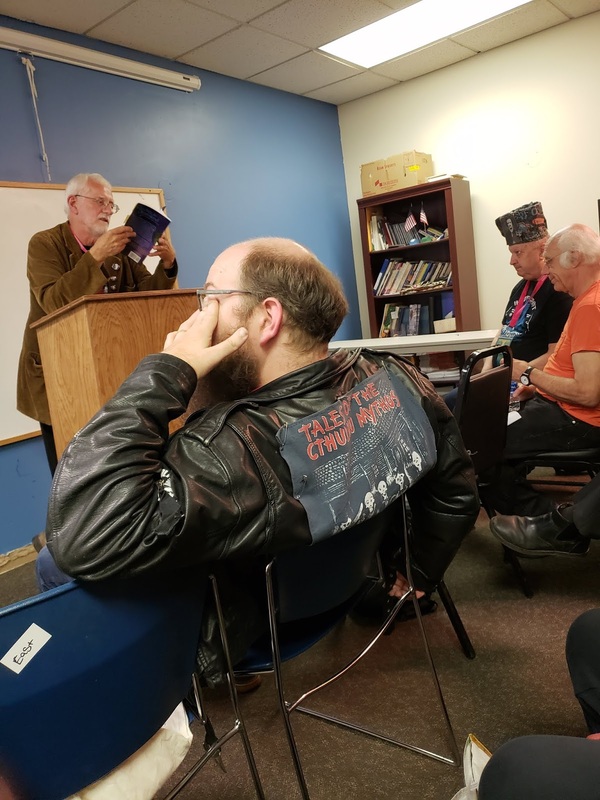 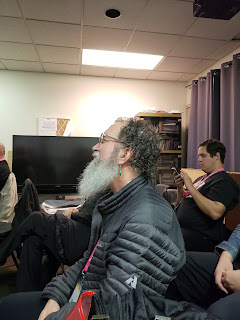 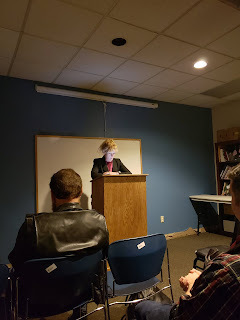 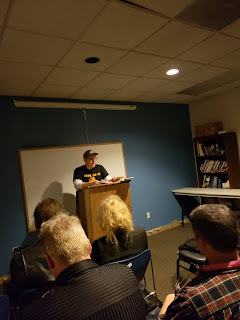 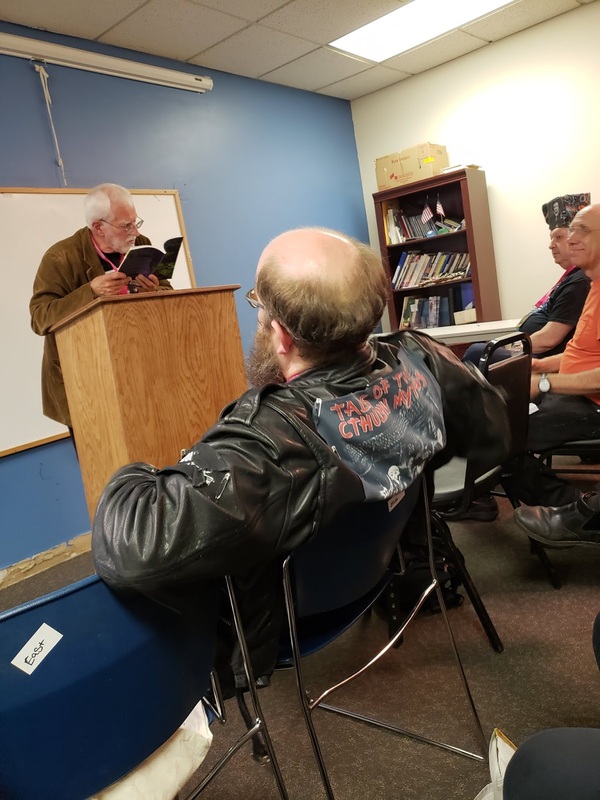 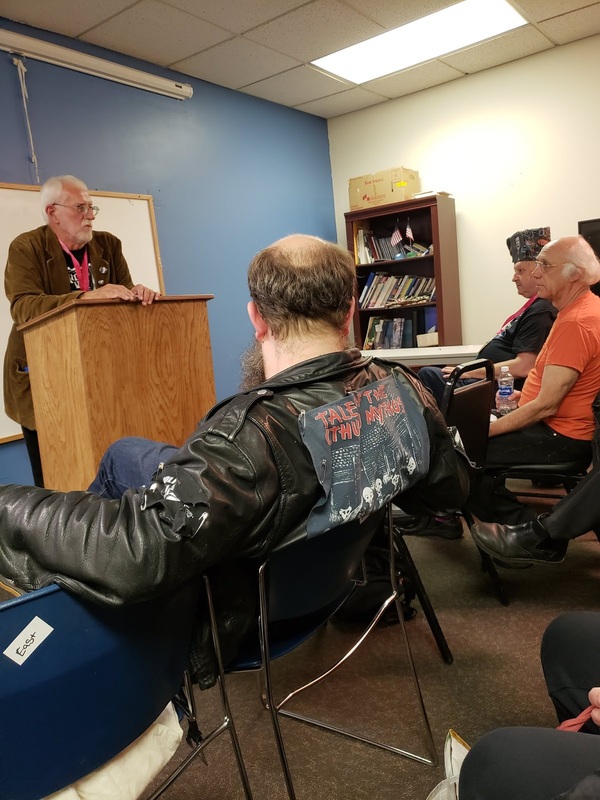 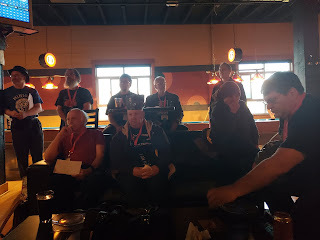 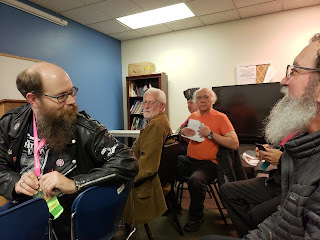 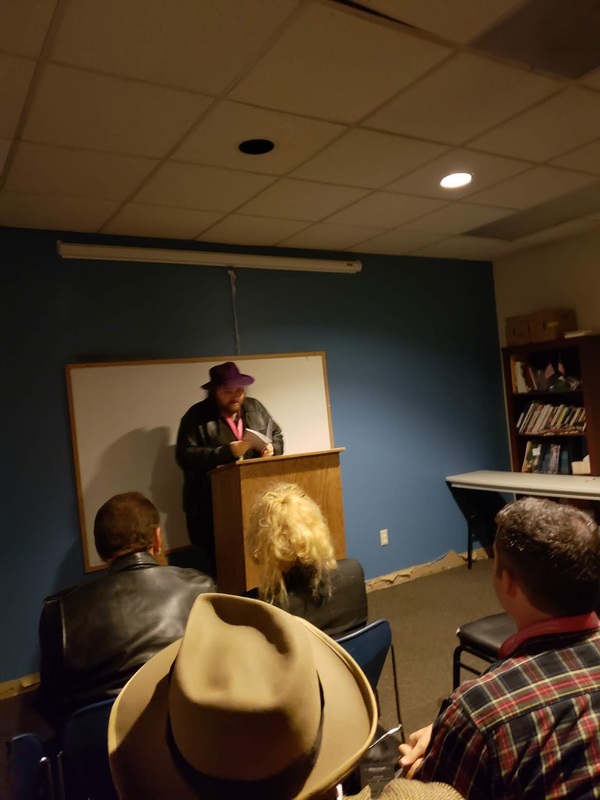 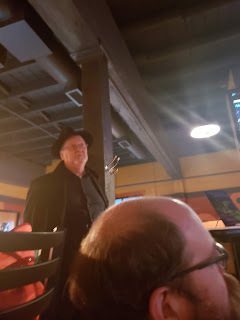 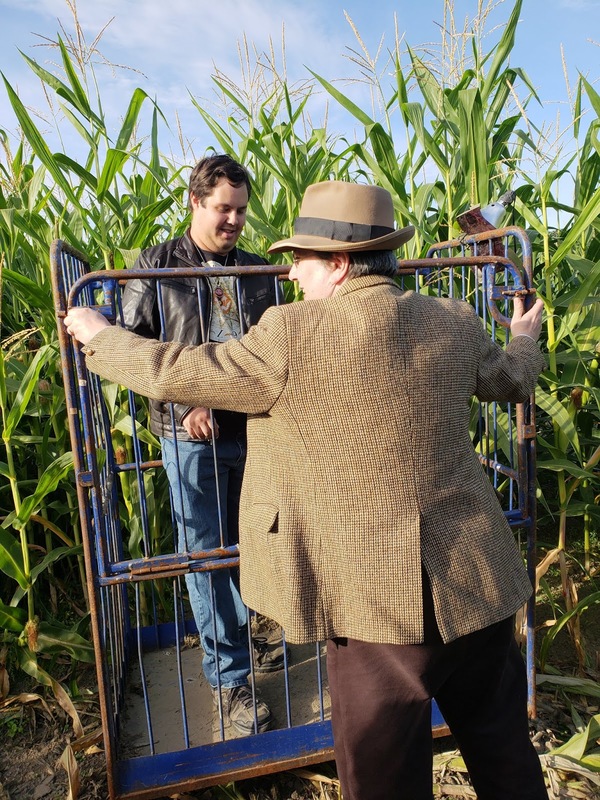 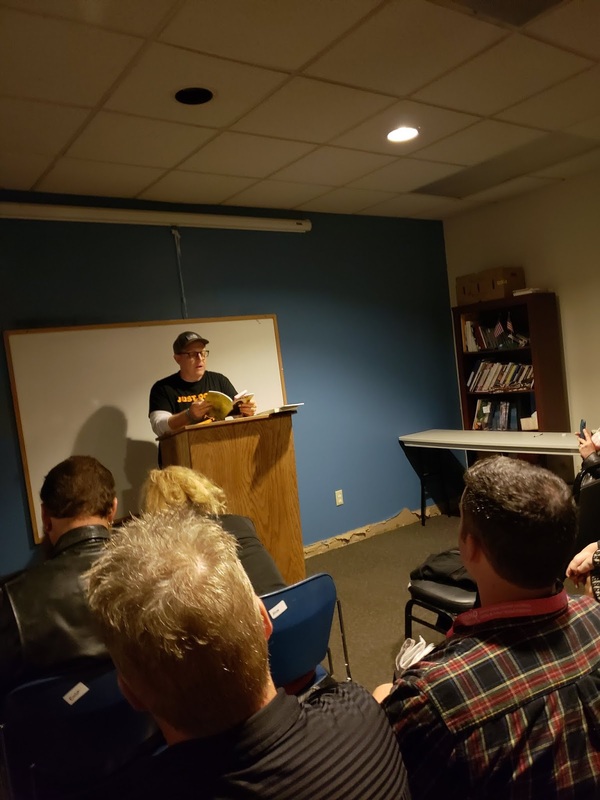 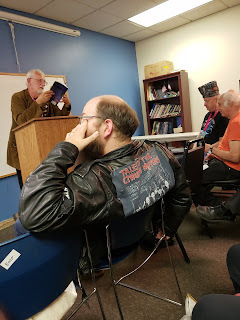 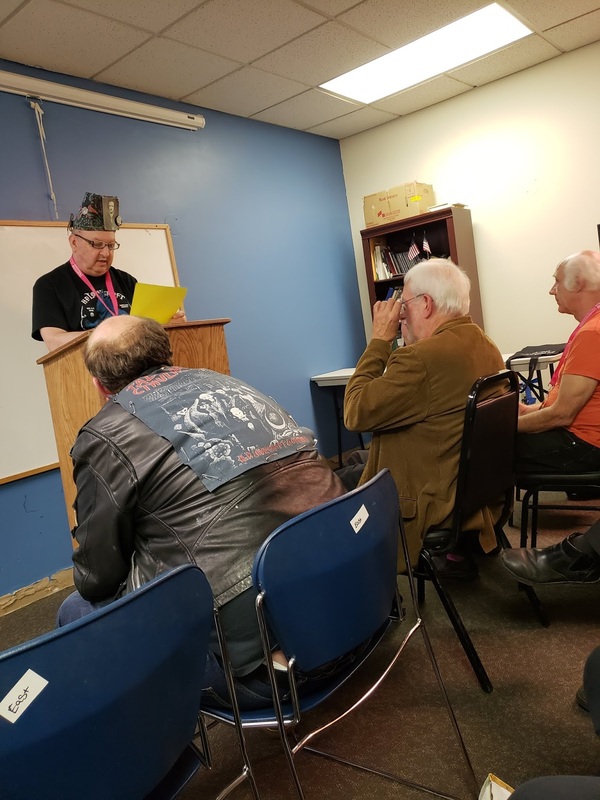 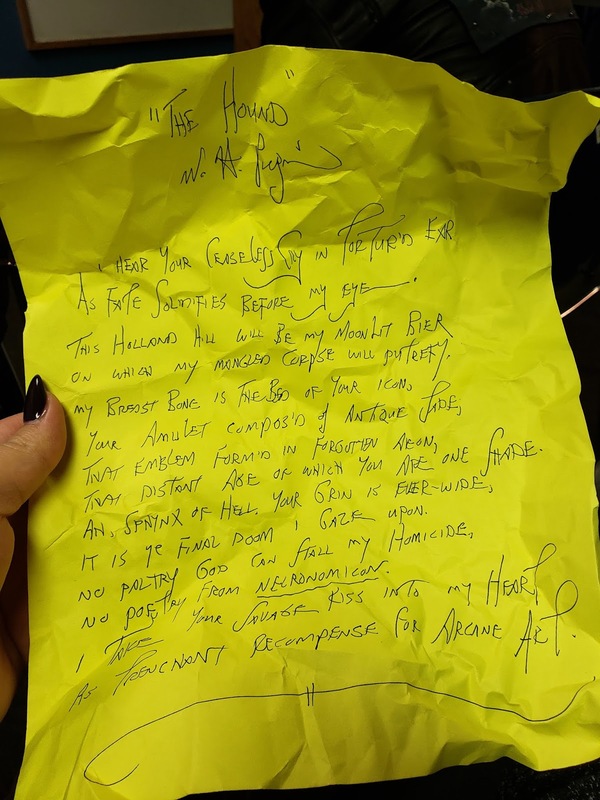 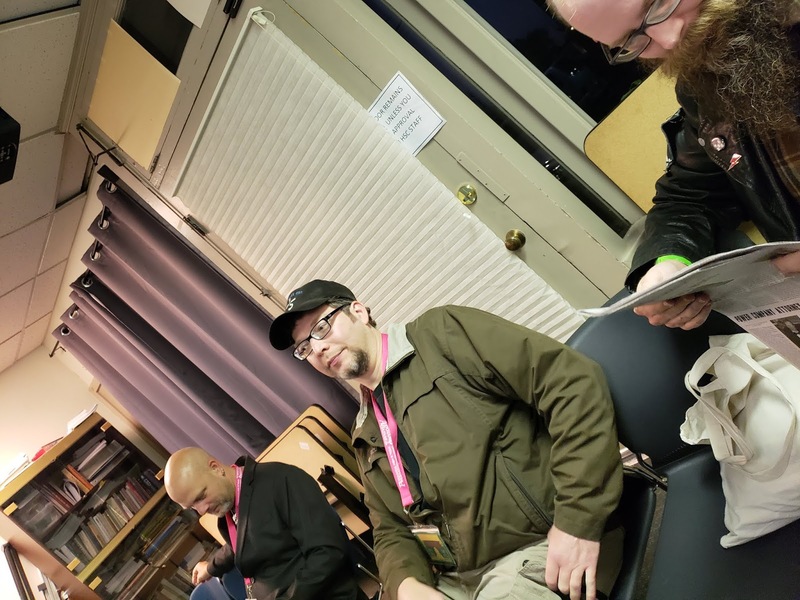 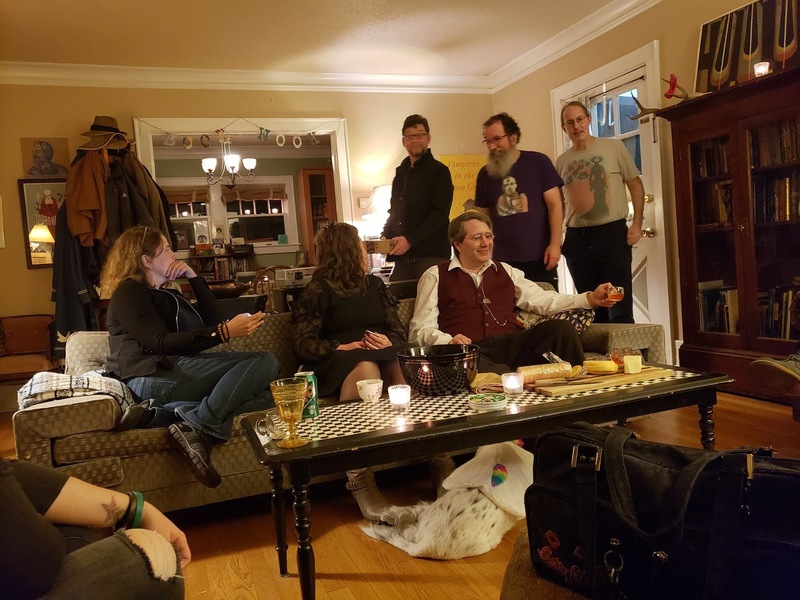 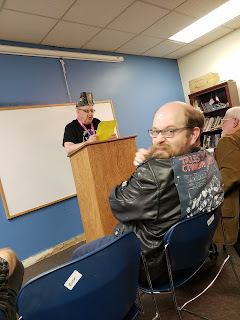 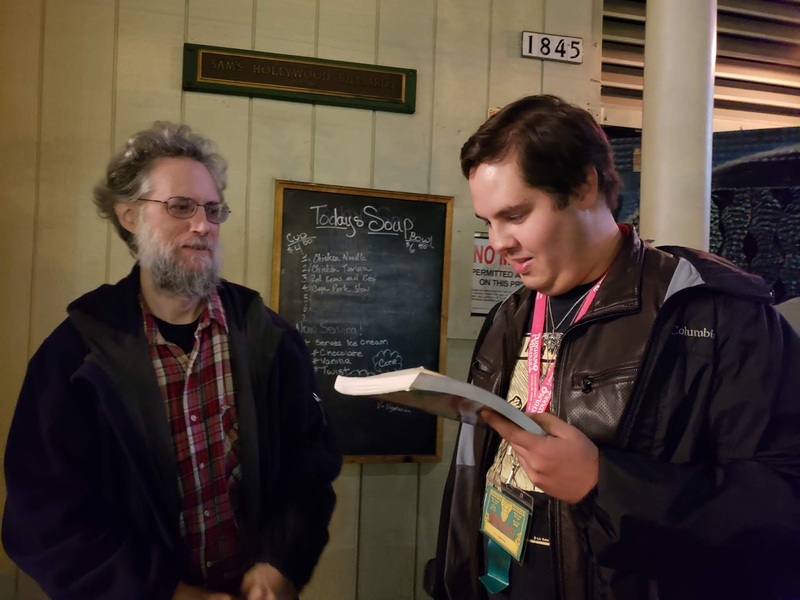 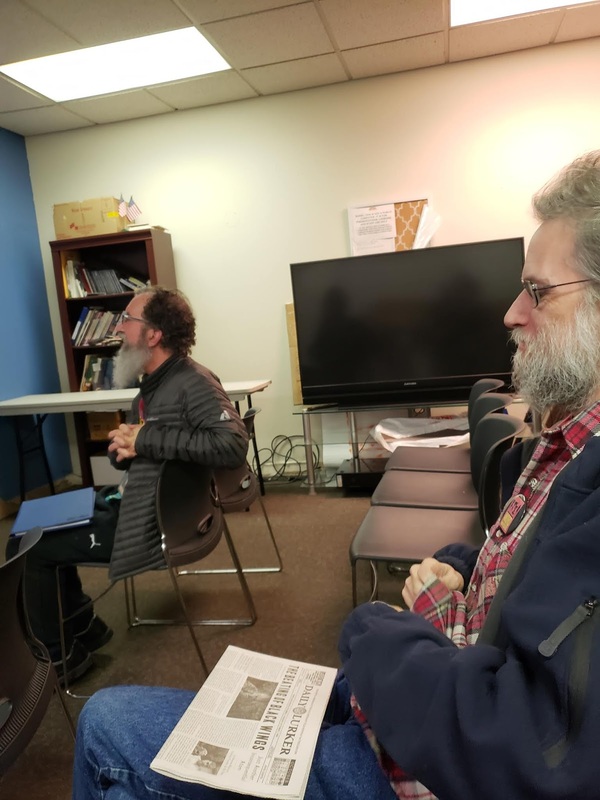 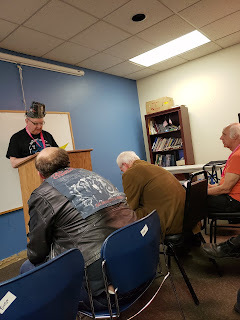 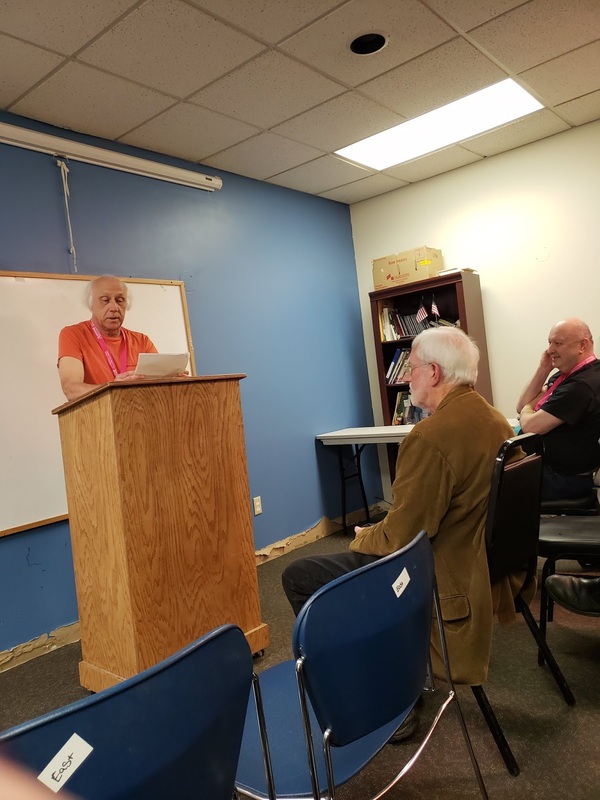 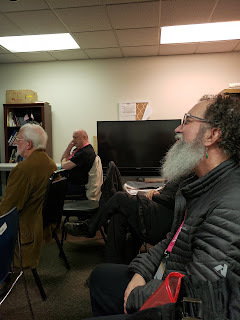 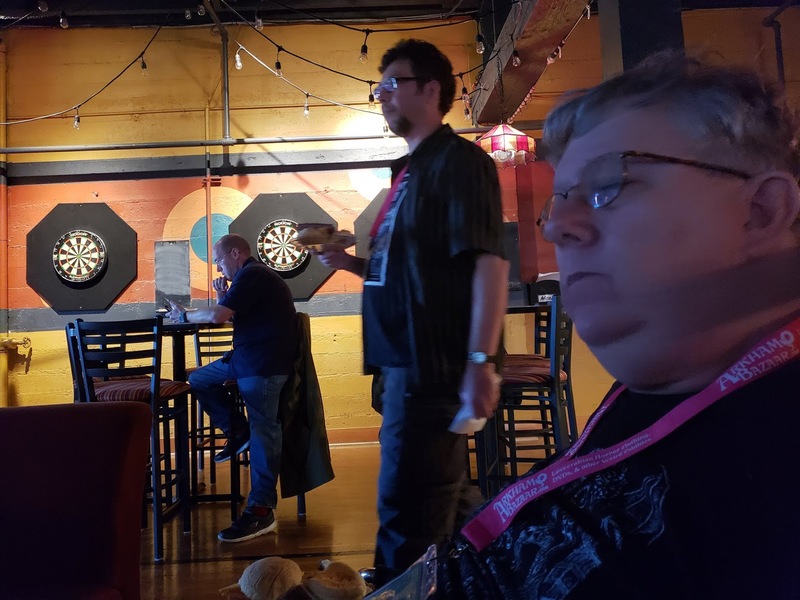 We somehow lost Blaine while at the EOD center and me and Dave headed to watch a reading by Wilum Pugmire, David Barker, and Jonathan Thomas. Next, we listened to Philip Fracassi, Garrett Cook, and Sarah Walker read. Sunday was pretty low key. 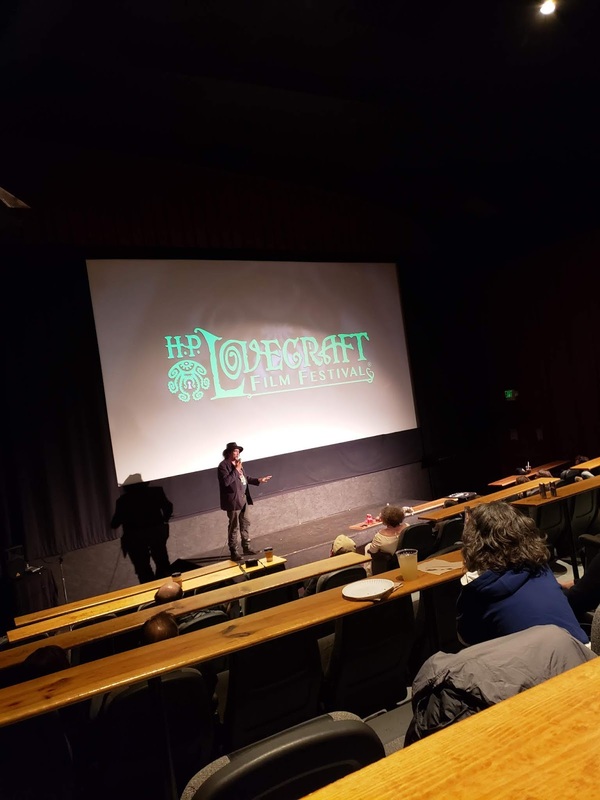 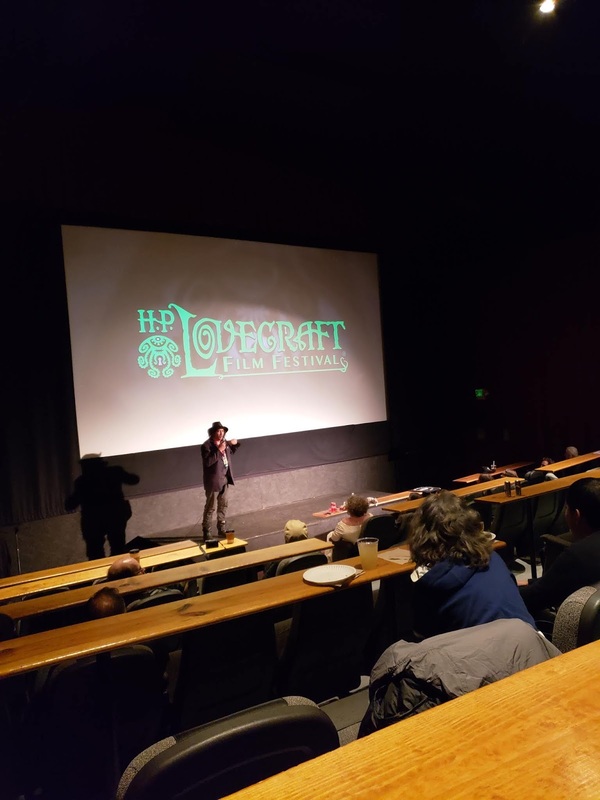 We watched some Clark Ashton Smith inspired shorts, two of which were written and made by Richard Stanley. 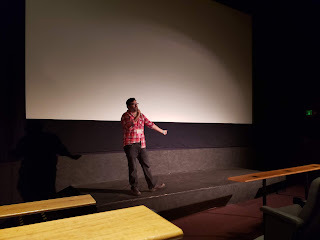 We then followed Richard to his presentation on The Color Out of Space film he's working on. 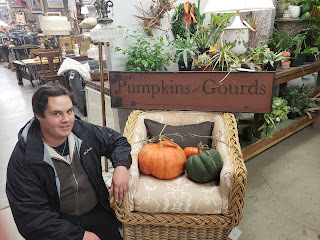 I think that pretty sums up everything. I bought 11 books between Hippocampus Press and Word Horde. 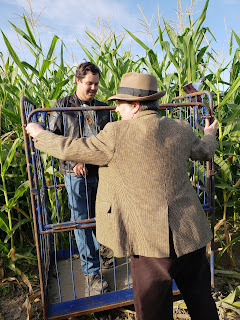 That was fun to lug home. 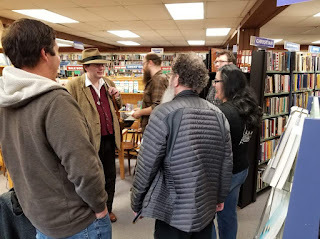 We were saved Monday from using Uber to get to the train station by the awesome Nathan Carson, author and musician, who took us to get Libanese food before dropping us off. On the train, we had dinner with Ray Garton and Scott Connors later that night. 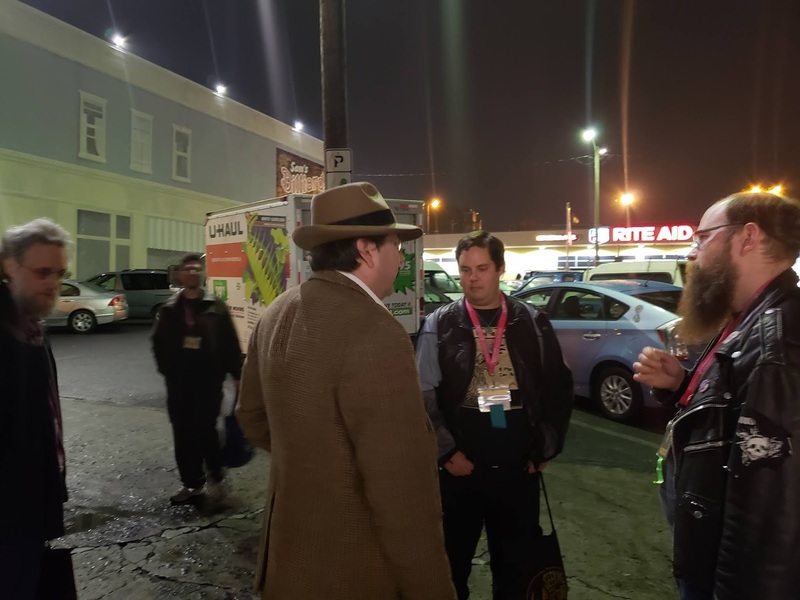 We then returned to the warm wastes of L. A. Tuesday night and headed home.